My Life and My Loves! ‘A study Space she’ll love’ collaboration with Pottery Barn Kids. Our home in Queensland Homes magazine. My Home in Australian Home Beautiful Magazine. My home on Reno Addict. 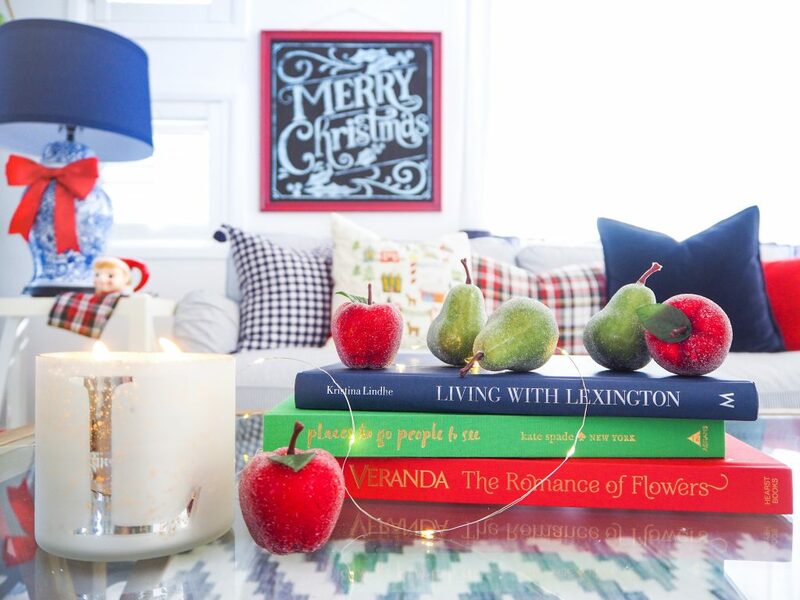 This year I was invited to join some of my favourite bloggers on a Christmas home tour. The gorgeous Jennifer from Dimples & Tangles and Rachel from Pencil Shaving Studio put this one together and I am so excited with the group of gorgeous girls they have handpicked for you! Firstly, let me just say I am totally chuffed to be part of such a fabulous group. I feel like I’ve found my tribe with these colour loving gals, their homes are bright, bold and beautiful and I love them all. OK, If you are following the tour, you’ve probably just come from the self-proclaimed freak herself, Jenna from Rain on a Tin Roof, her pops of bright colour and amazing wallpaper selections always makes me smile. Today I’m going to share my living room and bedroom with you. I recently discovered plaid, I mean I knew it existed, but I have ever used it in my home before. 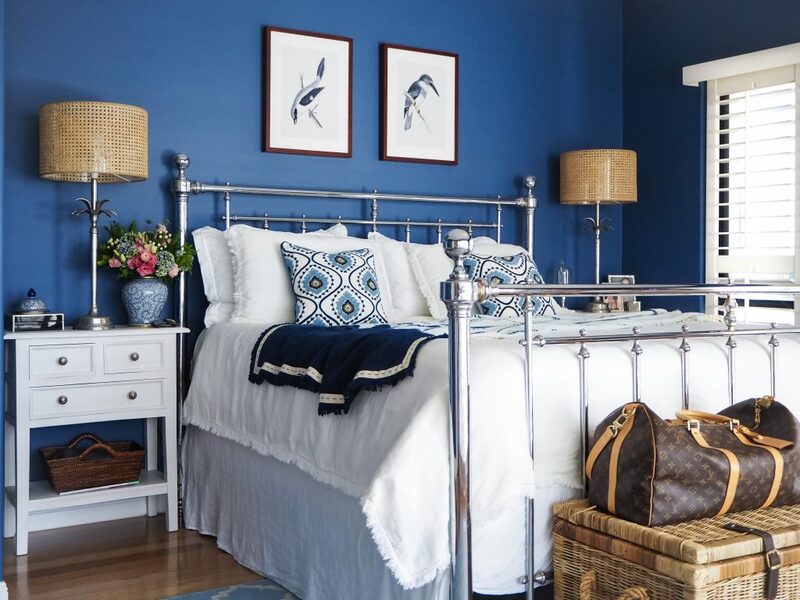 Then I found a fabulous plaid at Pottery Barn that has a touch of blue in it, so it mixes back with my #blueandwhite home beautifully. Now, I have a little obsession with plaid, OK, make that a BIG obsession with plaid! 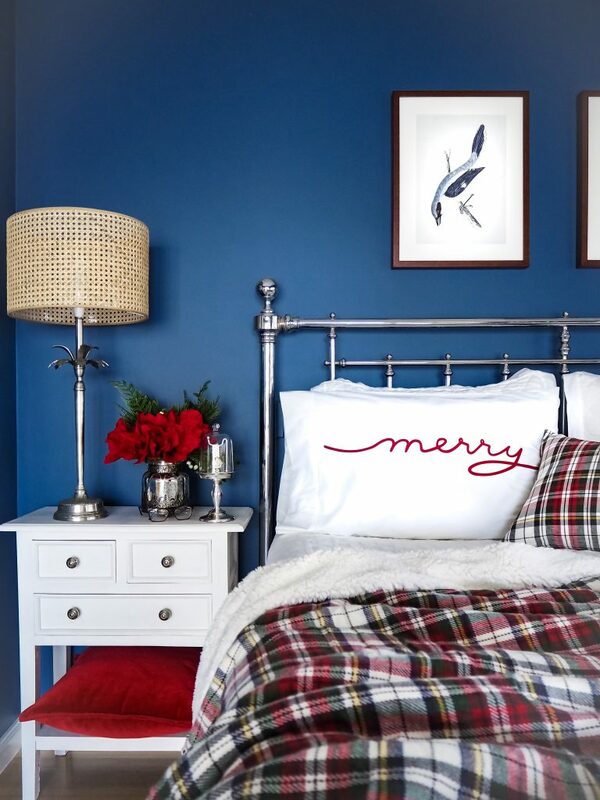 It was my inspiration for this years Christmas colour palette, I pulled the red and green from the plaid, and added it to my existing blue and white decor. I’ve also added lots of metallic accents like mercury glass, silver and galvanised metal to give it some sparkle! 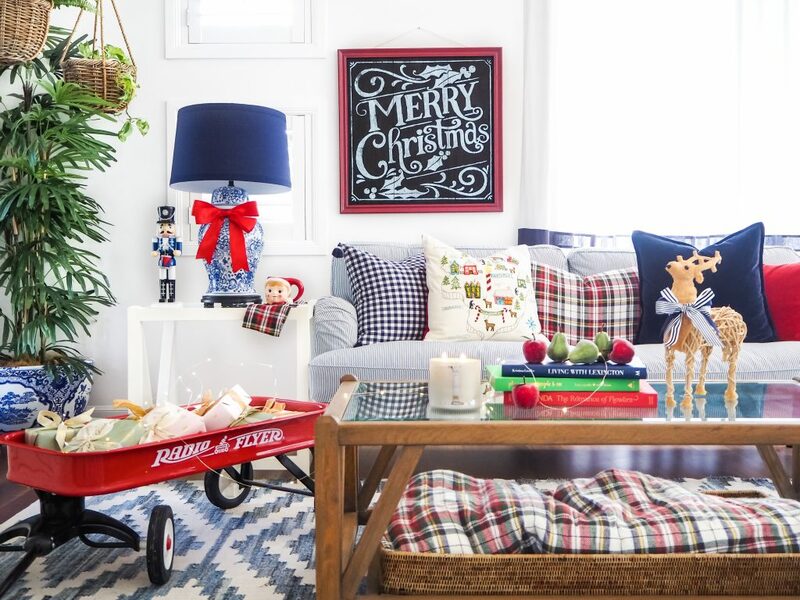 Lets start in my living area where you are welcomed with pops of red and lots of plaid which is perfect with my blue and white ticking sofa. My favourite thing is this room is the sweet pillow with embroidered and beaded details. 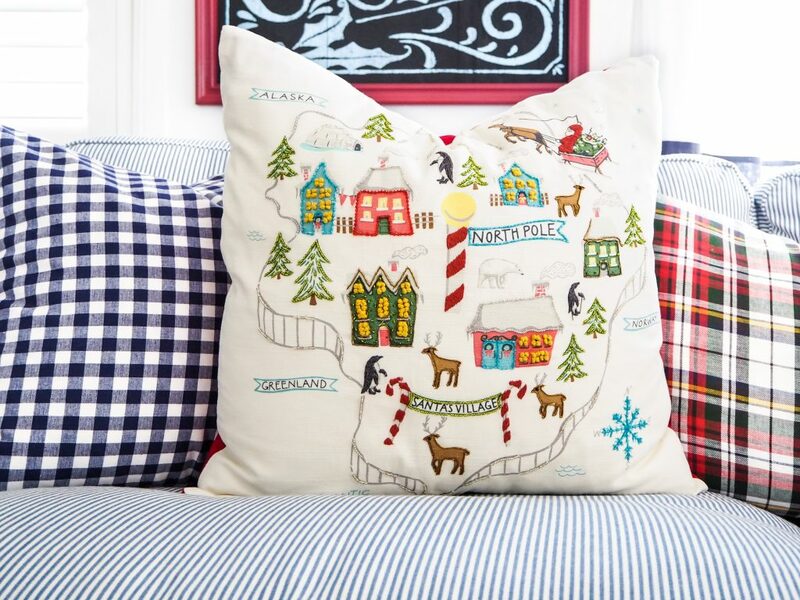 The colour and art have a vintage vibe that I adore, and the map of the North Pole has been a great conversation starter with the kids. I also adore these gorgeous little sugared fruit decorations that I found at my supermarket for 80 cents each, proving that it doesn’t cost a fortune to decorate your home! 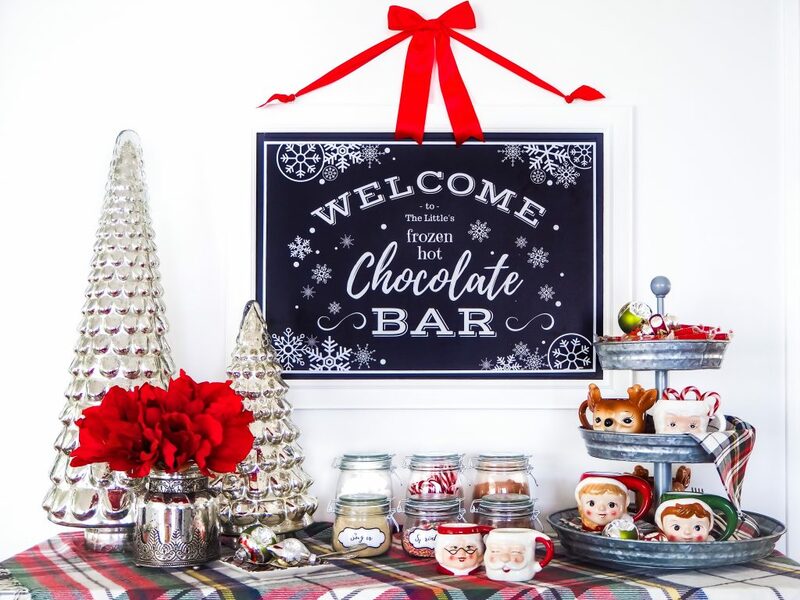 Just off the living room and next to the kitchen is this little area that I have turned into a FROZEN hot chocolate bar. It’s summer in Australia and too hot for the traditional hot chocolate so we’ve put in our own spin on it. The kids absolutely love it and it’s getting quite the workout! Everyone has their own mug and we have a few spares for guests. I designed the artwork myself and my Dad brought it to life. It was a quick and easy activity and I love that it is personalised with our family name. I bought the large frame from a local thrift store for a few dollars, the frame was originally a yellow pine wood, it only took me a few minutes to spray paint it white. My Dad has a giant printing machine so he printed my artwork to look like a blackboard, I’m sure you could get this done at your local printers. Then I added 2 small brass rings to the top of the frame to use the ribbon for hanging. 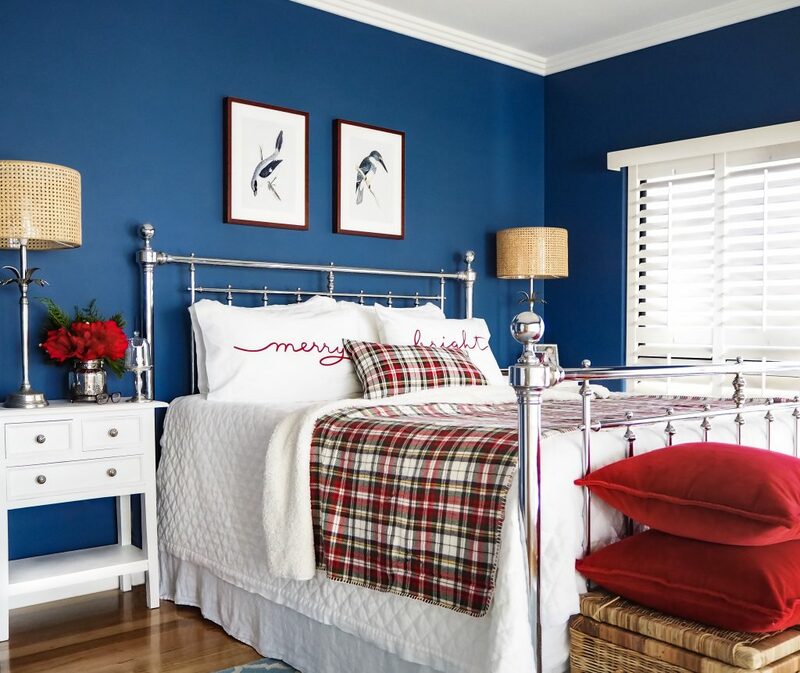 Let’s go to my bedroom next where the backdrop of my blue walls really makes the red and plaid pop! 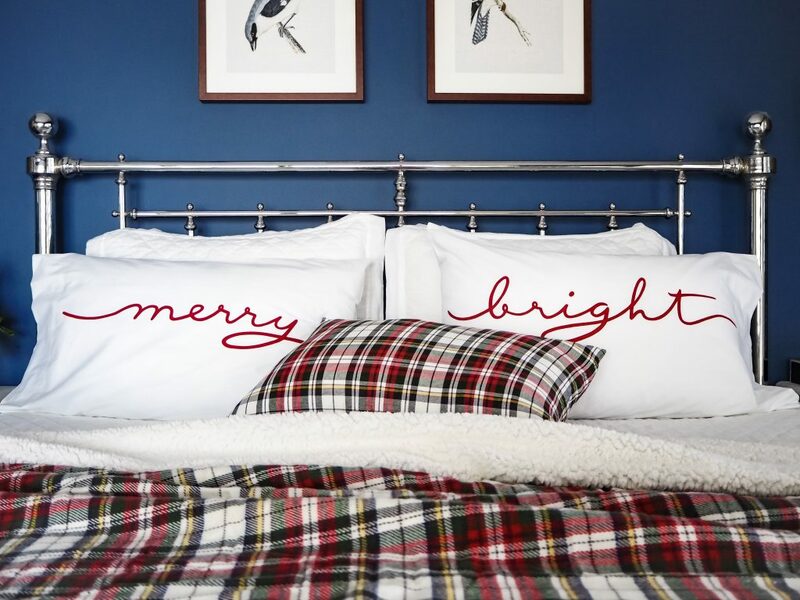 I’ve paired it with all white bed linen to keep it from looking too dark, and added the Merry & Bright pillowslips for a festive touch. I popped some traditional Christmas flowers – amaryllis – on the bedsides in these gorgeous glass vases, I love the little bit of sparkle the mercury glass vase brings. 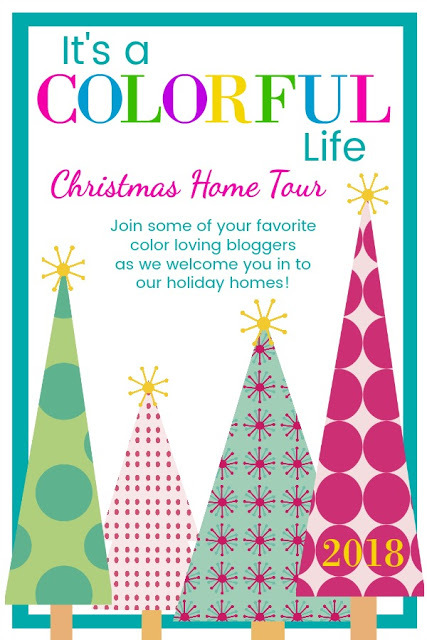 I hope you’ve enjoyed my colourful Christmas home tour! I’ll be sharing more of my Christmas decor over the next few weeks on my Instagram here. 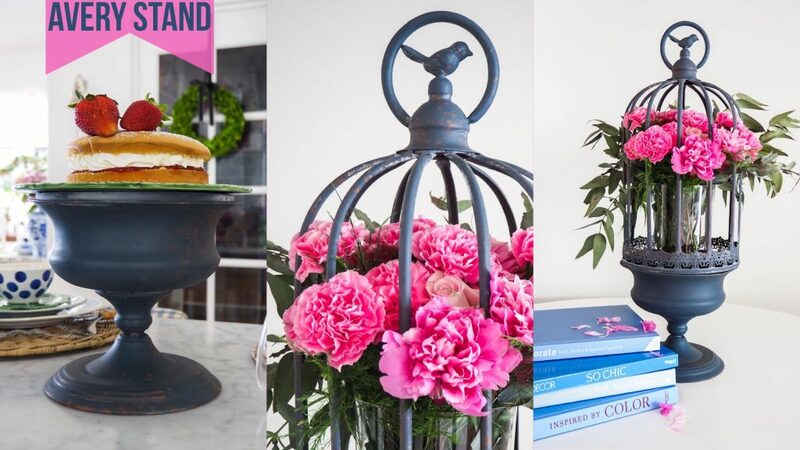 Now, refresh your cup of tea or glass of wine, and pop over to all of Tuesdays and Wednesday’s home tours, they are listed below, seriously guys, there is so much inspiration in these gals homes and style, you don’t want to miss them! Then tomorrow start with Pencil Shavings Studio and say hello to Rachel who loves blue and white nearly as much as I do. I can’t wait to see what she has in store for us! Gift Guide 2018 – For my Blue & White loving tribe! I couldn’t let this opportunity slip by! 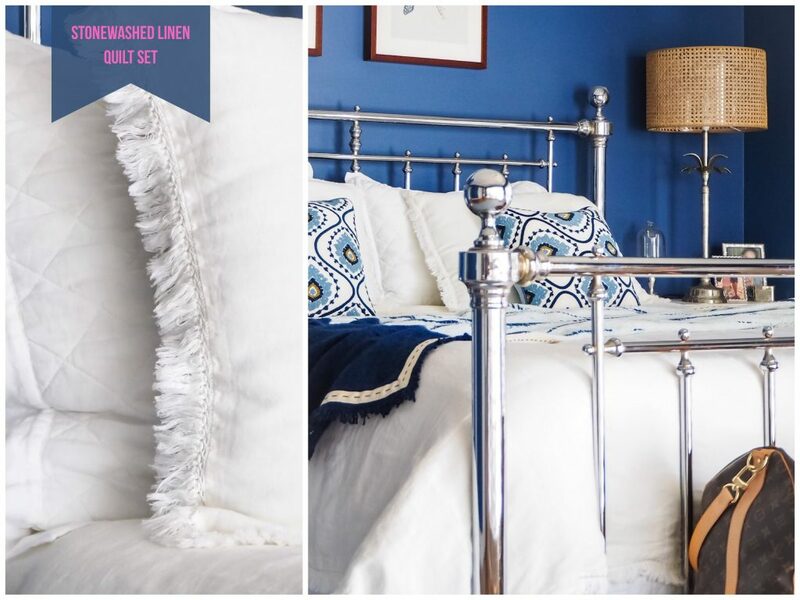 The chance to share all my favourite blue and white finds, some of them that you haven’t even seen before, just in time for Christmas shopping! That’s right, I’ve kept a few pieces in hiding until this blog post. I wanted to reveal all the goodies together to give you all an equal chance to nab your favourite pieces before they sell out, and they will sell out, because they are all AH-MAZ-ING! 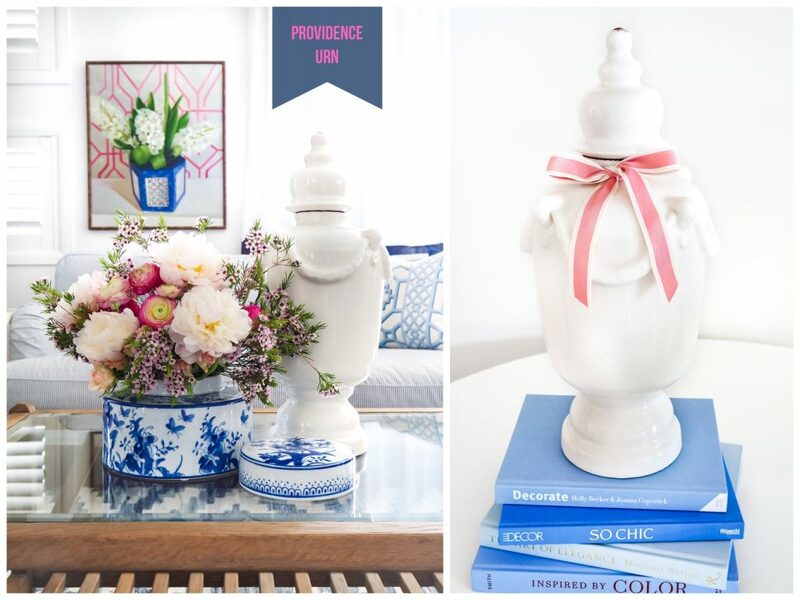 Blue and White ceramics have been around for 100’s of years, they are used in many different decorating styles these days from Chinoiserie to Hamptons, Coastal, Country, Nautical and more. 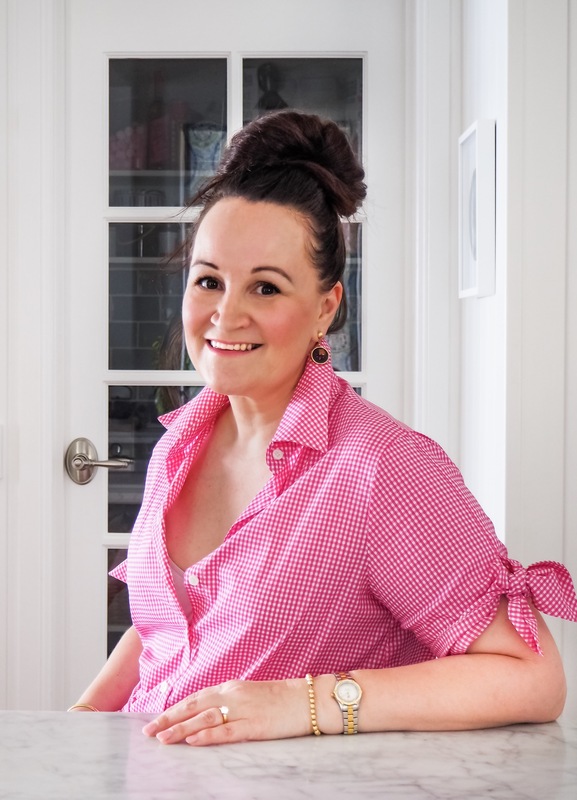 I’ve also included some of the essential styling items that we all like to mix in with our B&W … things like rattan, silver, iron and white ceramics. They all compliment each other and are sometimes necessary to break up all the B&W. I’ve also tried to include pieces that will work in all the different decorating styles so hopefully you can find something perfect for your home and your style. Australia has come a long way in the home decor market over the last last few years … finally! We have many more options available to us now, so I’m going to tell you exactly why I chose each of these pieces and what I love about them. Scroll Pattern with gold trim Ginger Jar – These speciality ginger jars with gold trim are some of the most coveted pieces by B&W collectors. They are hard to find and sell out at lightening speed. Never fear, I’ve found the mother load! There is only 1 or 2 pieces of each design and they come in a variety of shapes and sizes. This will be a treasured piece to hand down through the generations, good luck just choosing one! 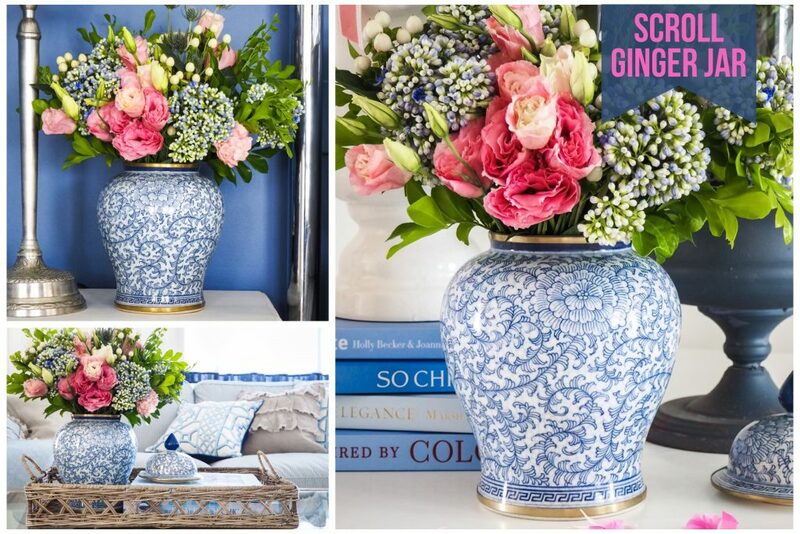 Lotus Ginger Jar – I chose these ginger jars because they have a striking blue pattern that really demands attention and they are a great price for the size which makes it affordable when you want 2. 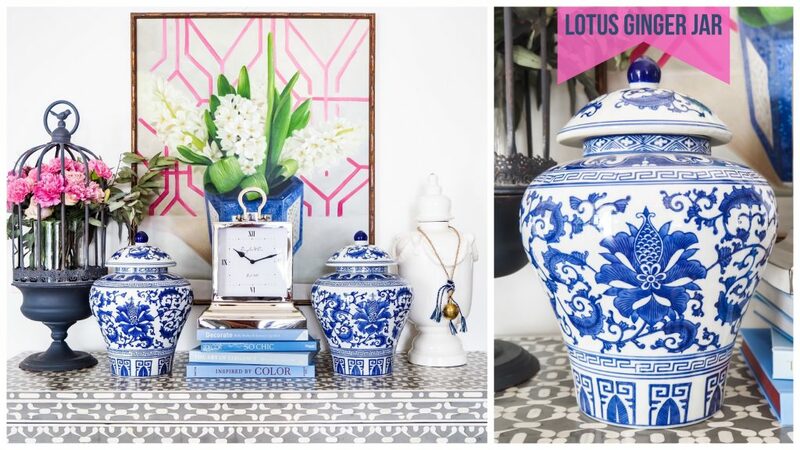 I love to buy things in pairs, styling with pairs brings symmetry and symmetry makes my heart sing. 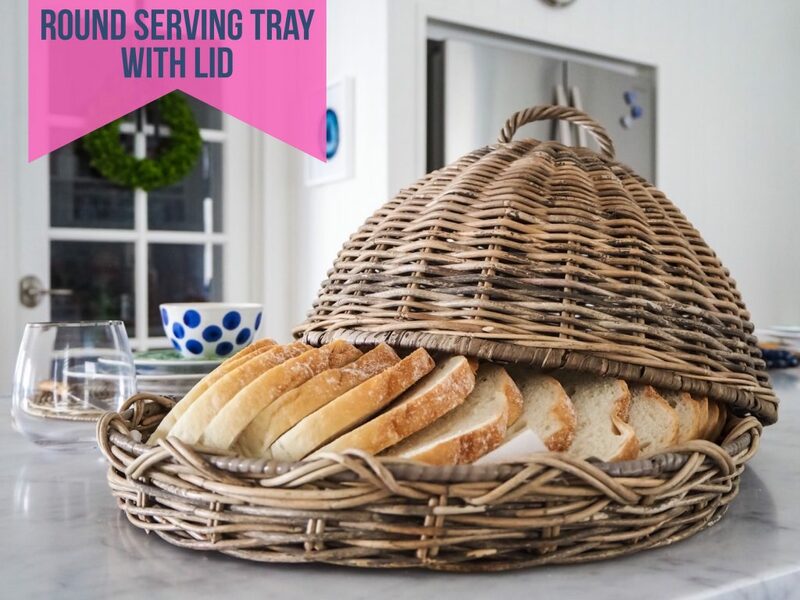 Rattan Round Tray with Cloche – OK, lets be honest here, I have wanted one of these for ages. I don’t care if I never use it, it can sit in my home and look gorgeous. 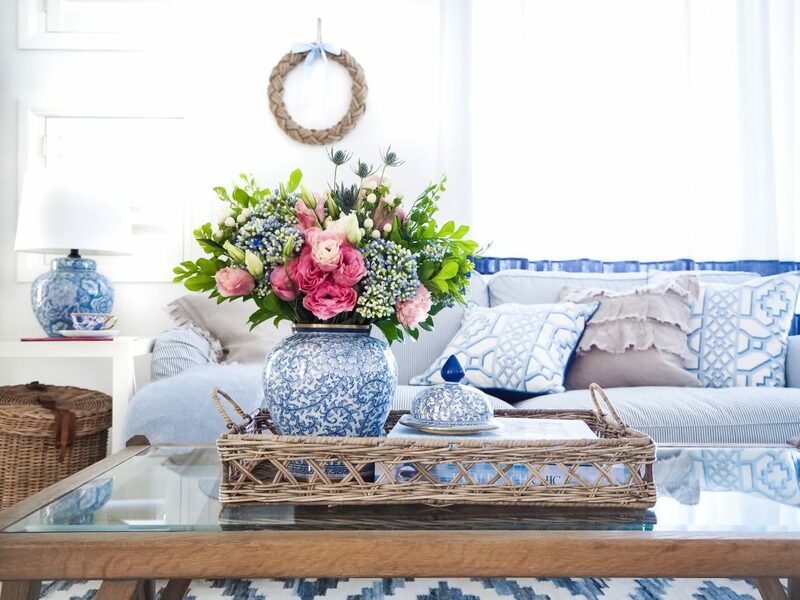 Rattan brings an instant country or coastal vibe to your home, especially when mixed with blue and white. It is classic, affordable and would make a lovely gift paired with some luxury food items. 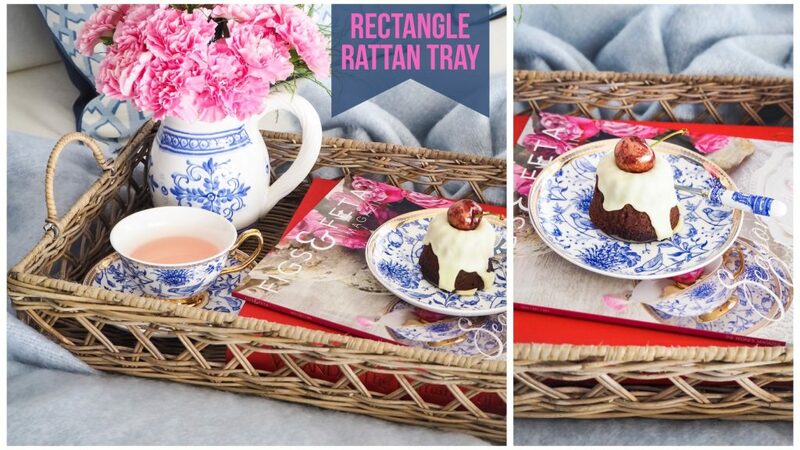 Rectangle Rattan Tray – A tray is such a versatile item. Use it to create a stylish coffee table vignette with a stack of books, a few B&W pieces in varying heights and a candle ….. Use it in the bathroom for your bath items, a beautiful orchid in a blue & white pot and a candle ….. Use it to carry your plates and cutlery from the kitchen to the dining table or use it to serve your loved ones breakfast in bed. 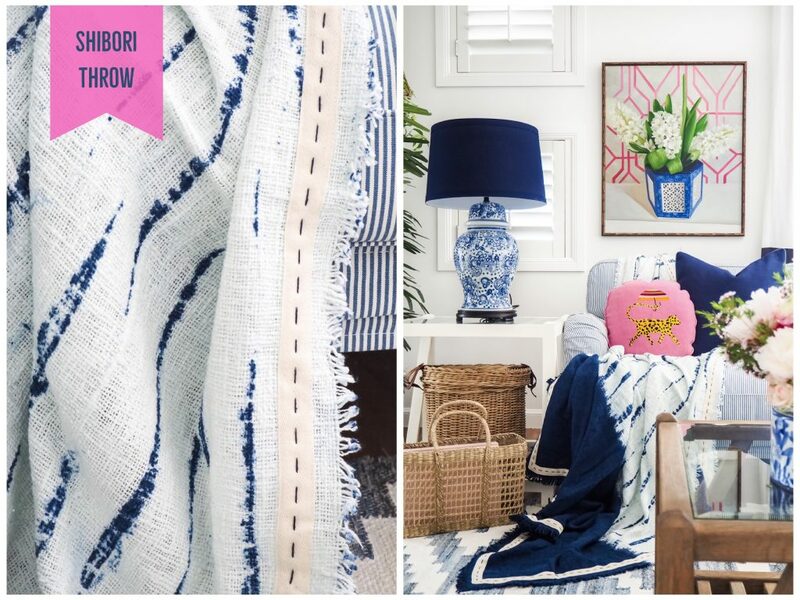 Shibori Throw – I love the organic nature of this Shibori throw. If you don’t love floral prints, Shibori is another way to break up all the graphic prints and harsh lines. It brings movement to your space and a fabulous pop of colour. Mohair blanket – Ummm, did you see this blanket? Mohair is made from pure angora goat wool, it is super soft and indulgent. 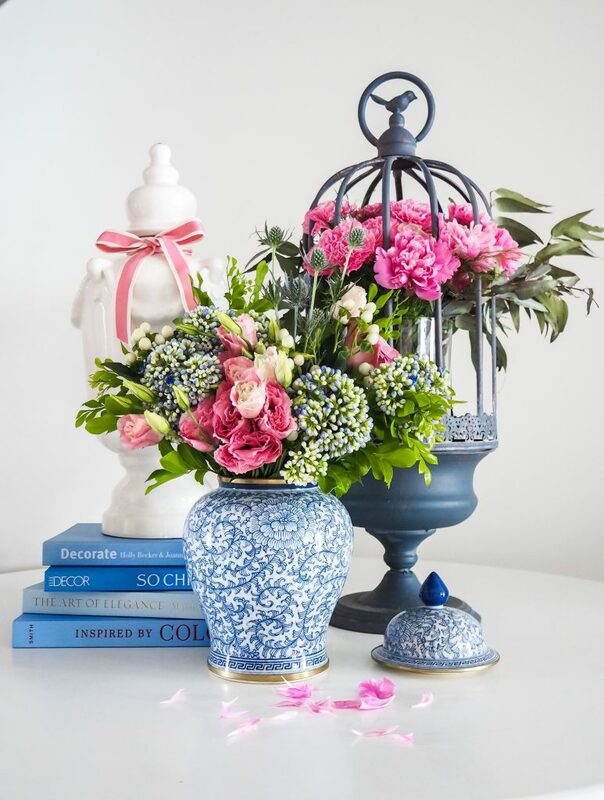 This one is the most beautiful duck-egg blue and just oozes sophistication. Everyone deserves a little bit of luxury, right? This is one of those gifts that you would absolutely love to receive but is probably something you would never indulge in yourself, I think it’s those things that makes the best gifts! 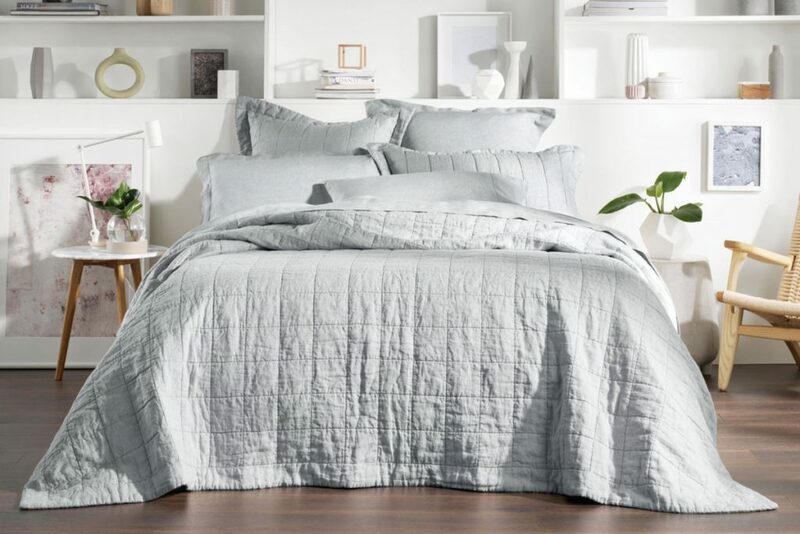 Stonewashed Linen quilt set – Y’all know how I feel about linen, completely obsessed! 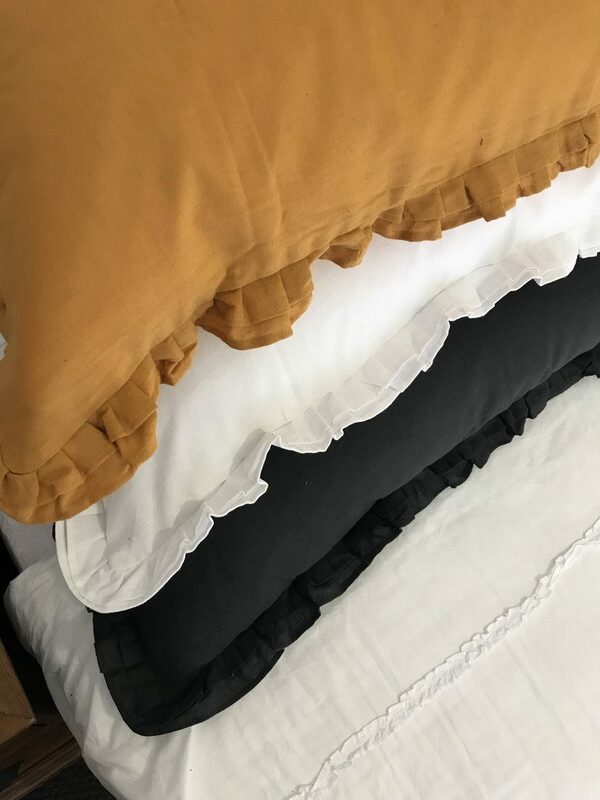 I chose this quilt cover set because it is plain white so it will mix back with any colour, including our beloved B&W, but what I really caught my eye was the sweet fringing around the edge. It’s the small details like this that really elevate a piece into something special. 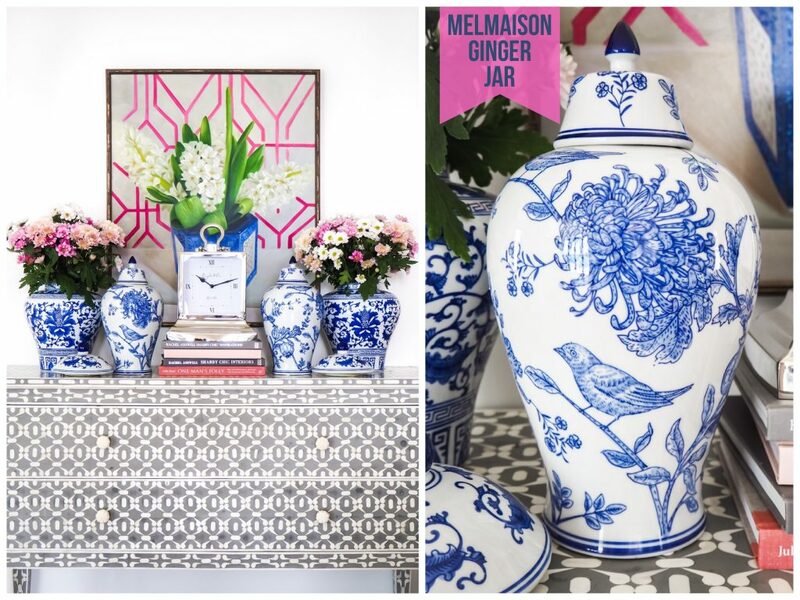 Melmaison ginger jars – I love something that is unique, the print on this jar is hand painted with the brands own signature print by Chinese artisans. You won’t see this pattern everywhere. Again, at under $100 per jar, they are well priced and perfect to style in pairs. 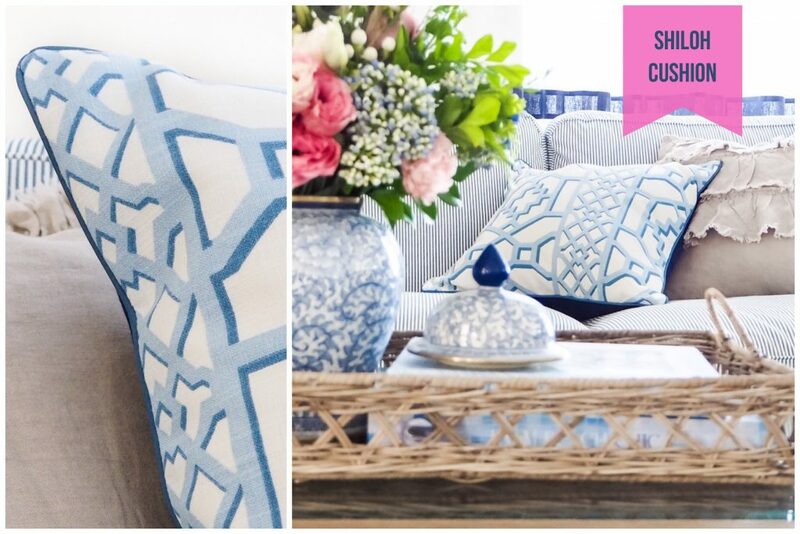 Shiloh cushions – A classic trellis pattern evokes a chinoiserie vibe, but the gentle colour palette makes it beautiful for many more home style. I love creating a mix of cushions consisting of one graphic print, one floral or organic type print and one solid. This trellis ticks all the boxes for my graphic selection. 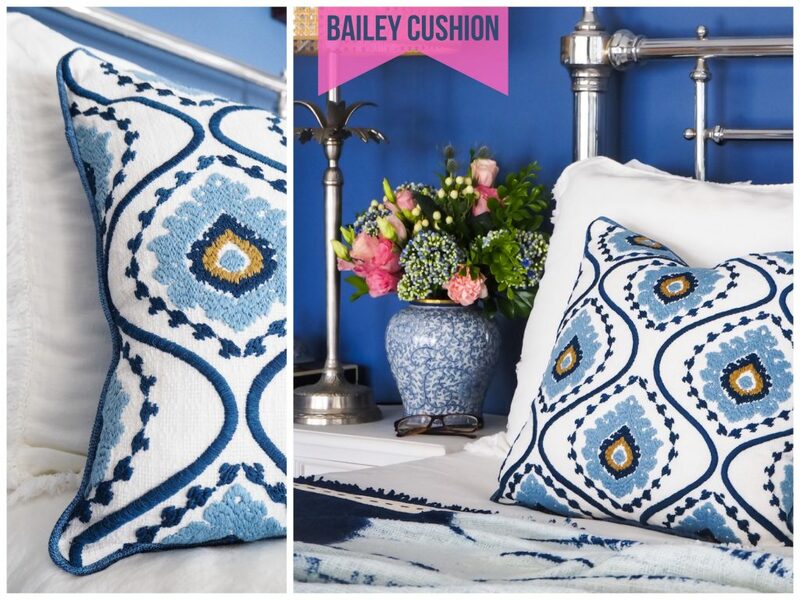 Bailey cushions – I choose this one because I love the colours, the baby blue and navy blue has the ability to feel quite cold, but the pop of mustard on this cushion instantly warms it up. I also love the strong embroidered pattern. Providence Urn – This piece is such a classic shape and is finished in a beautiful hand crackled finish. The natural white ceramic looks amazing with a group of blue and white pieces, it gives your eye somewhere to rest and brings a sense of timeless French style. Avery Stand – I love adding a little bit of vintage to every space, but it’s not always possible to find the right piece for each space. This iron stand is hand painted to appear aged and brings that same warmth and sense of history to your display. It is such a versatile piece, I love it styled with a plant or flowers, or you can use as a bowl/food stand and cloche for food as it is actually 2 pieces. 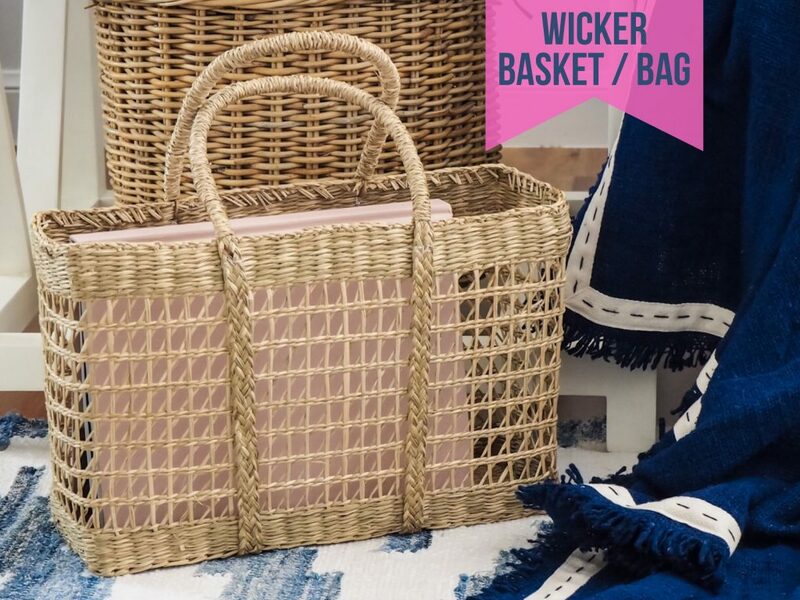 Open Weave rectangular basket – Not just for fashion, a great bag like this one also makes a gorgeous styling prop. Fill it with books or magazines, or use it for your knitting, whatever you put in it will look stylish. Also, seagrass is a perfect warm compliment to B&W, particularly gorgeous in Coastal homes. 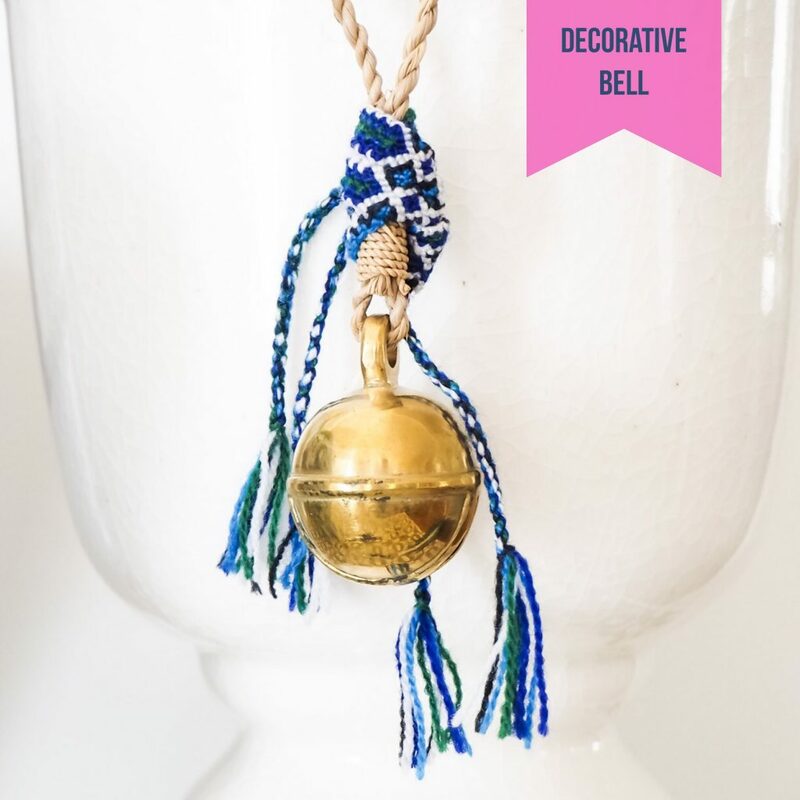 Decorative Bell on Jute – Like that little cherry on the top of your ice-cream sundae, this little bell is a finishing touch that adds interest and personality. I adore it’s braided wool embellishment in our favourite colour palette. 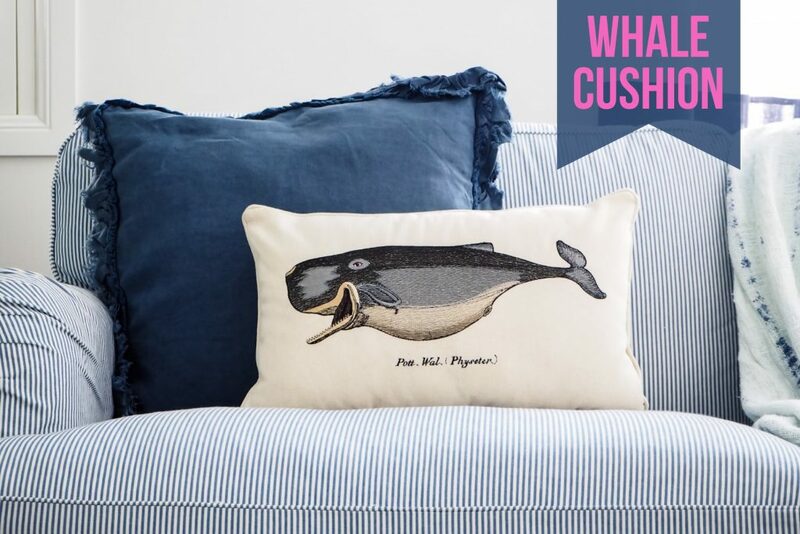 Whale Cushions – For the nautical and coastal homes, whale decor is a necessity, and this cushion is so chic. It is embroidered on a natural cotton with contrasting piping, the blue colour palette mixes perfectly with your B&W pieces. Wooden Boat – While we are talking coastal and nautical …. 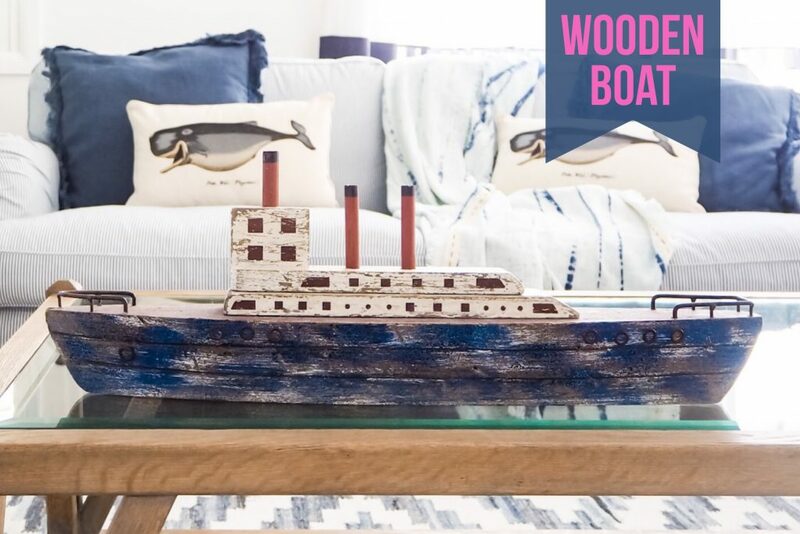 how fun is this wooden boat? It is a playful decor item, but the rustic wood makes it stylish rather than childish. I love adding a conversational piece like this to a space, and its B&W. 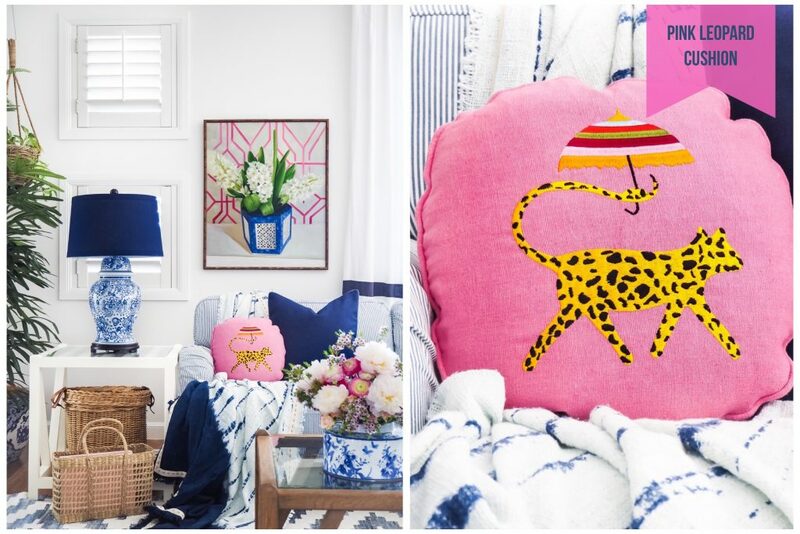 Pink Leopard cushion – Sometimes you need a bright pop of colour to break up all the B&W. This pink cushion is so fabulous and would be ideal for a modern chinoiserie styled home. 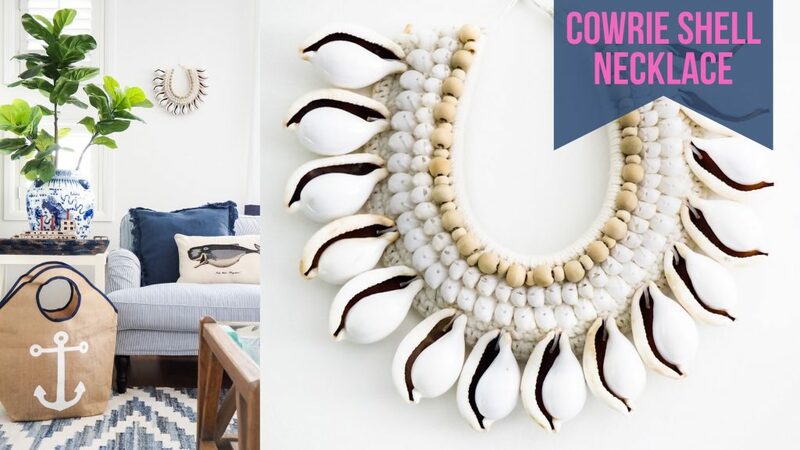 Cowrie Shell necklace – Shells go hand in hand with B&W in Coastal and Hamptons style homes. The tribal necklaces look beautiful on stands, on the wall or around the neck of a giant ginger jar. 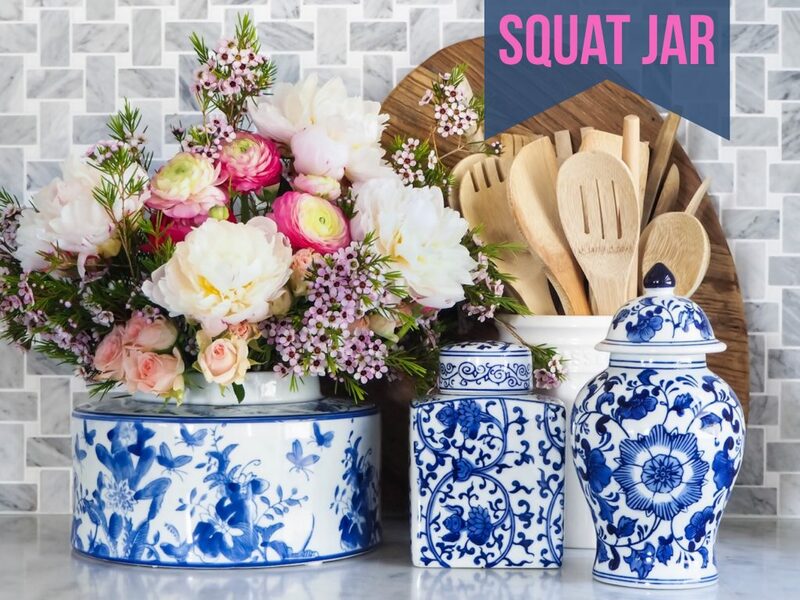 Squat Jar – What I really loved about this jar is the shape. It is a substantial size, but it is low, which makes it great for a coffee table or dining table because it doesn’t block the conversation, it’s also perfect for the kitchen bench as it fits under the overhead cupboards without looking crammed in. I have been searching for a piece like this for ages! 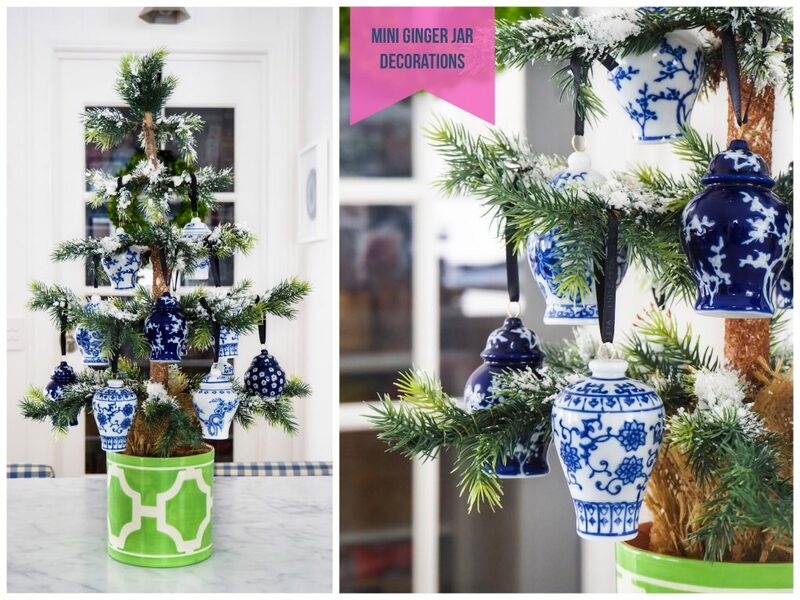 Mini Ginger Jars – Yes, Mini! We all love something that is miniature and these ginger jars are no exception. 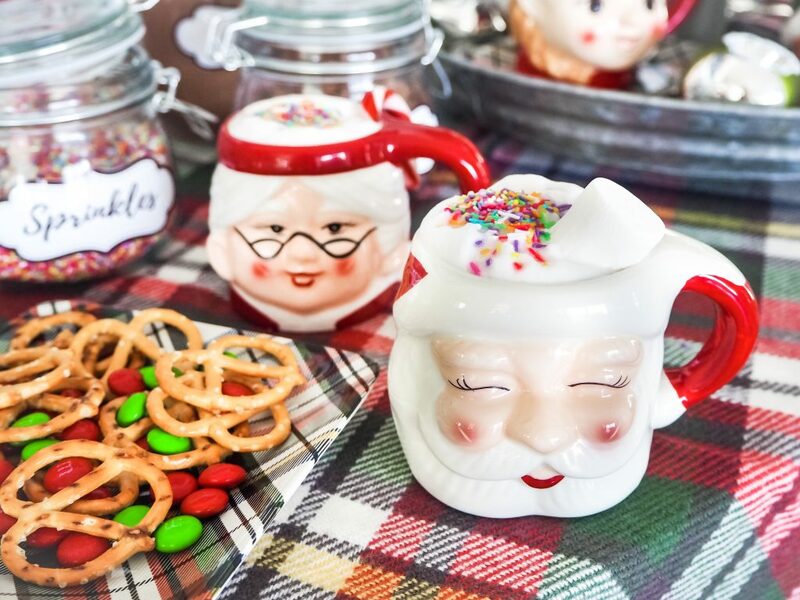 They are the perfect size to use in the kitchen for tea, coffee or sugar. 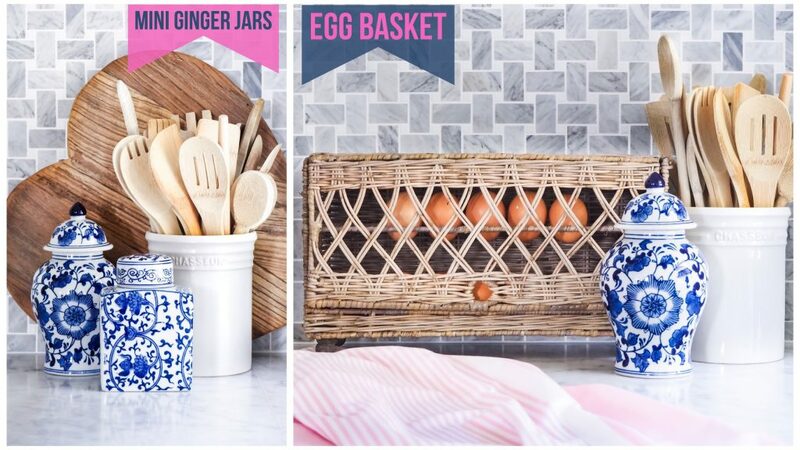 Egg basket – This caught my eye as soon as I saw it, I can imagine it in a Country or Farmhouse kitchen full of fresh eggs and styled with some vintage B&W pieces handed down through the generations. 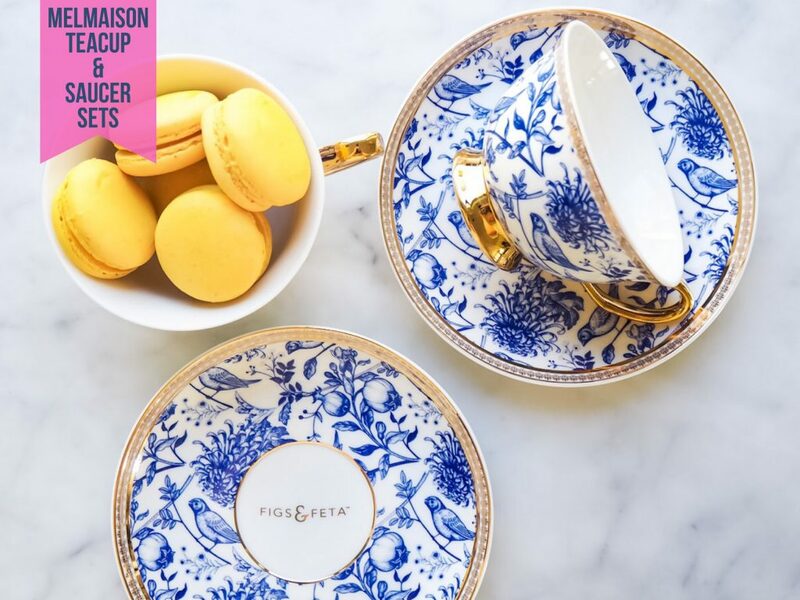 Melmaison teacups – Everyone loves a pretty tea cup and this is one of the prettiest ones I’ve found in ages. The delicate blue and white print is complimented by a shiny gold trim. It’s lovely to drink from and would make a lovely gift, especially when paired with some fancy tea. 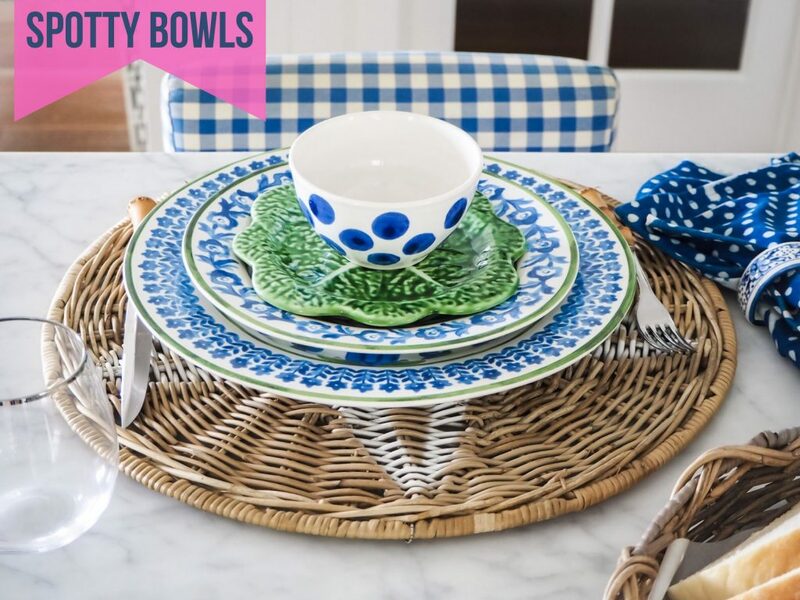 Spotty Bowls – Hello spots! Have I told you how much I love spots? They are playful and classic and I love these little bowls for ice-cream sundaes on a Sunday night. 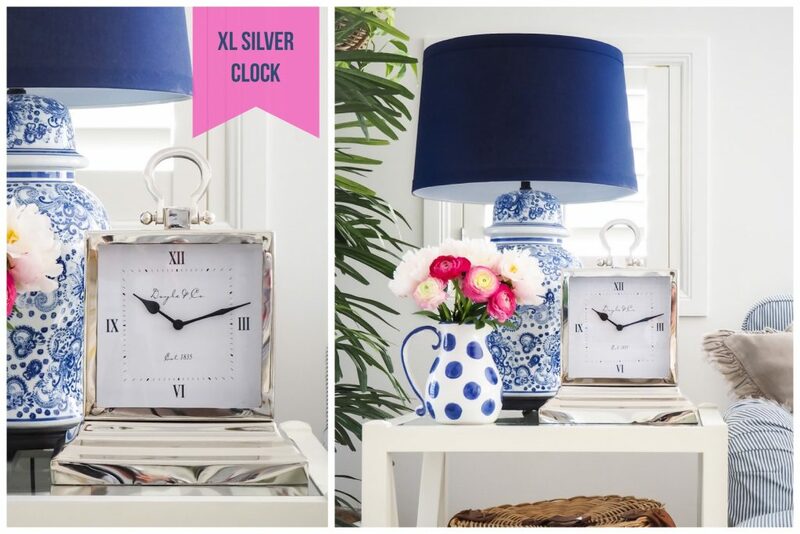 XL Silver Clock – This is such a statement piece! Silver always looks classy with B&W ginger jars and this clock is the perfect piece to style with a pair of ginger jars on a sideboard or entry table. 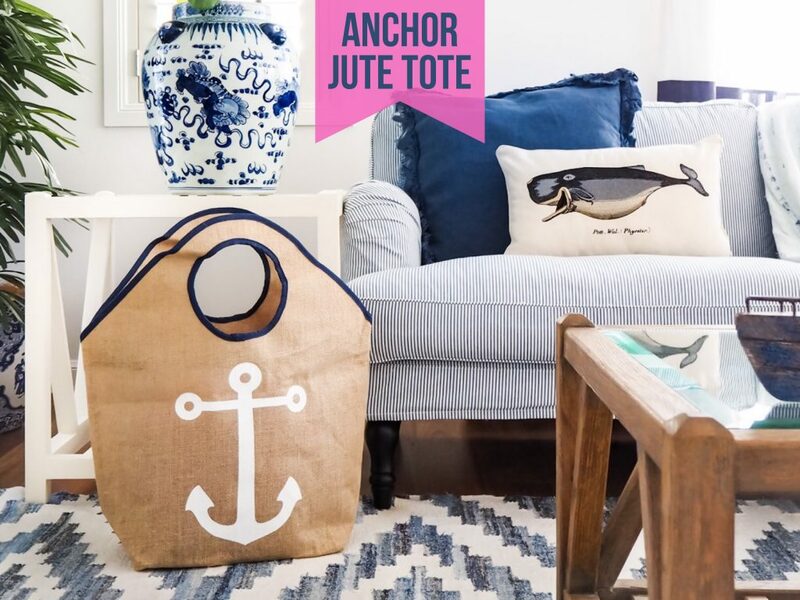 Anchor Tote – Jute and anchors are classic coastal elements, this waterproofed bag is highly functional for a beach day, but it also looks just a fabulous in your home as part of the decor. 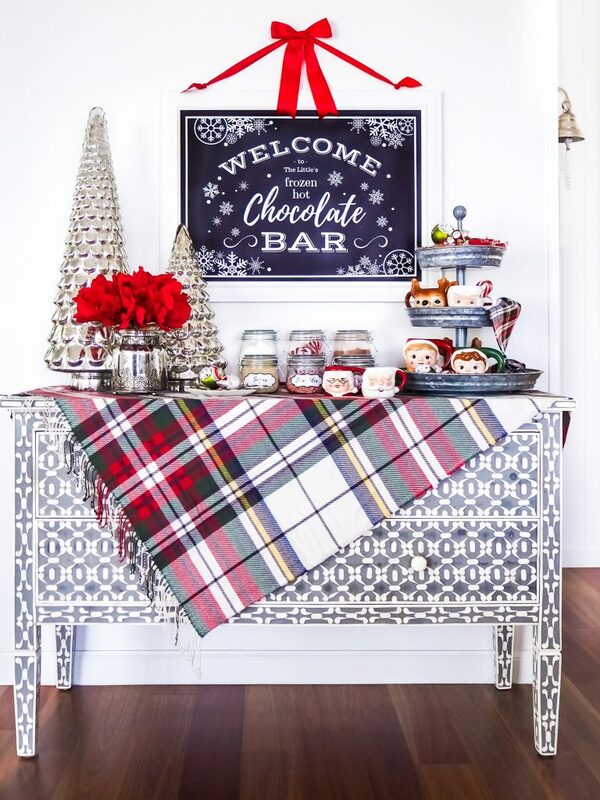 B&W Decorations – Most definitely not just for Christmas, I think these will be sweet little additions to a bedside vignette or coffee table tray. Keep an eye on my Instagram, I’m sure you’ll see these pop up in my photos often. 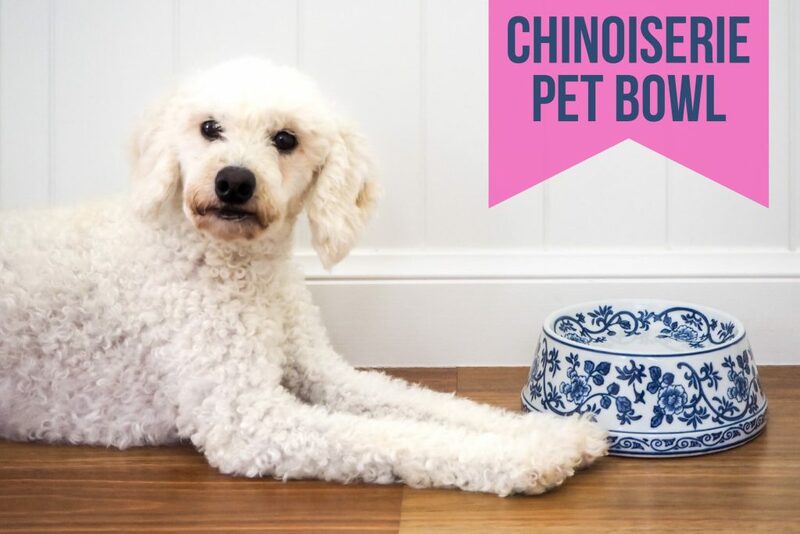 Chinoiserie Pet Bowl – Our fur babies are part of our family so why not let them have a bit of B&W too, this doggy bowl is absolutely gorgeous and will look equally fabulous in your home. Happy Blue & White shopping friends! Disclosure : Some of these pieces were gifted, all of them were hand selected by me, all opinions are my own. Y’all know I don’t share things unless I love them, love the quality and love the brand. 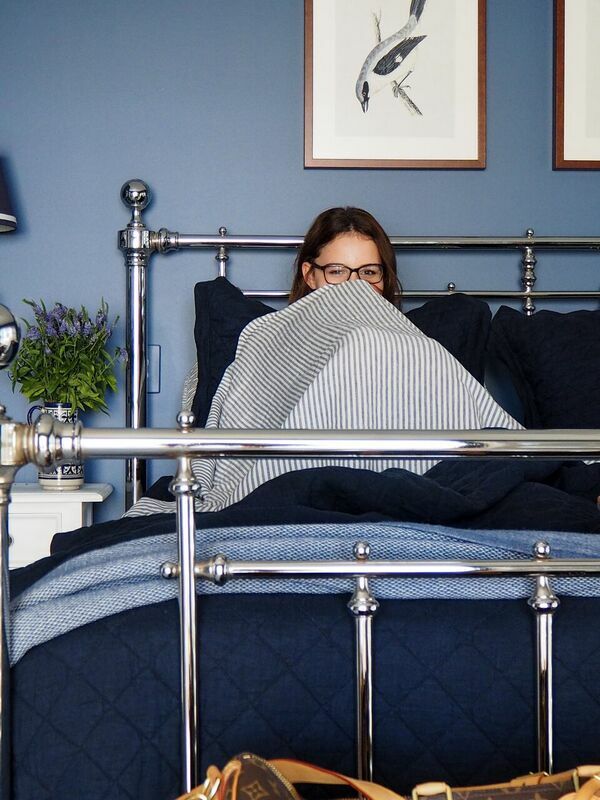 Do you have unlimited cash to spend on luxurious bed linens? So I thought I’d share a few different looks you can achieve with just a few pieces. Firstly, this is not one of those Pinterest worthy, magazine ready, takes 3 hours to make your bed type of posts. 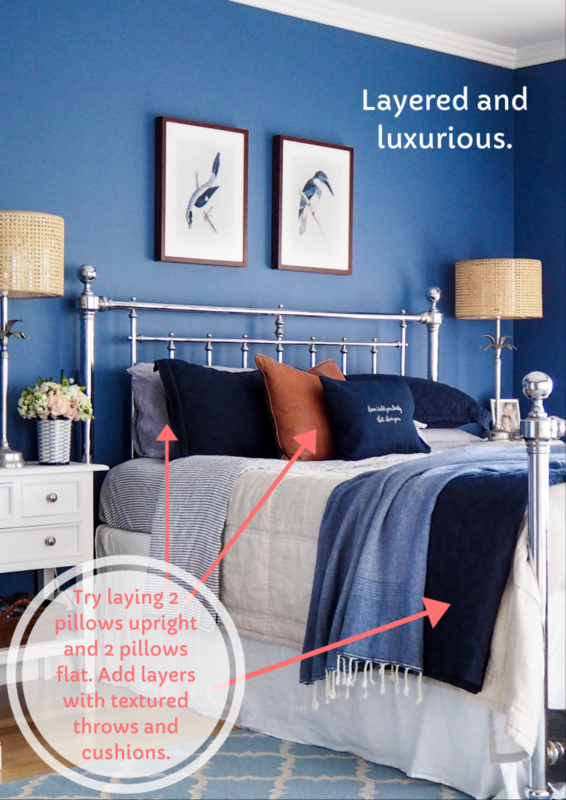 This is how to achieve a styled bed everyday in just a few minutes, because I’m pretty sure y’all have better things to do than obsess over your perfectly placed throw pillows. Also, please excuse my lack of ironing, my sometimes blurry photos and my weirdly high bed … real life people! 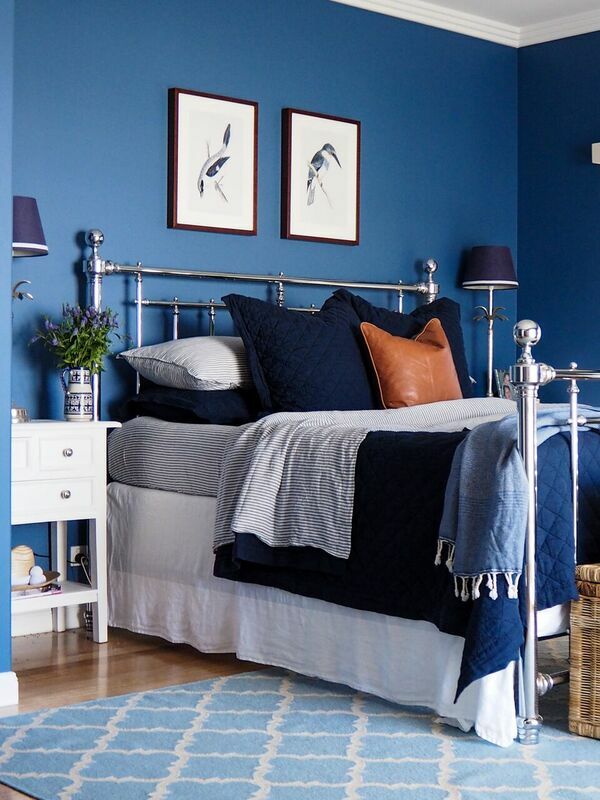 There are places to splurge and places to save, especially with bed linen. One of the things I’ve always splurged on and never regretted is a basic white or neutral coloured quilt or comforter. It is the perfect base for so many looks throughout the whole year. I prefer a quilt or comforter over a doona and doona cover as they sit beautifully on the bed, I don’t have to do the shake and shuffle with huge king size doona covers and they are often larger than a doona, which is great when you sleep with a #quilthog who pulls it all to their side during the night (the #quilthog might be me). 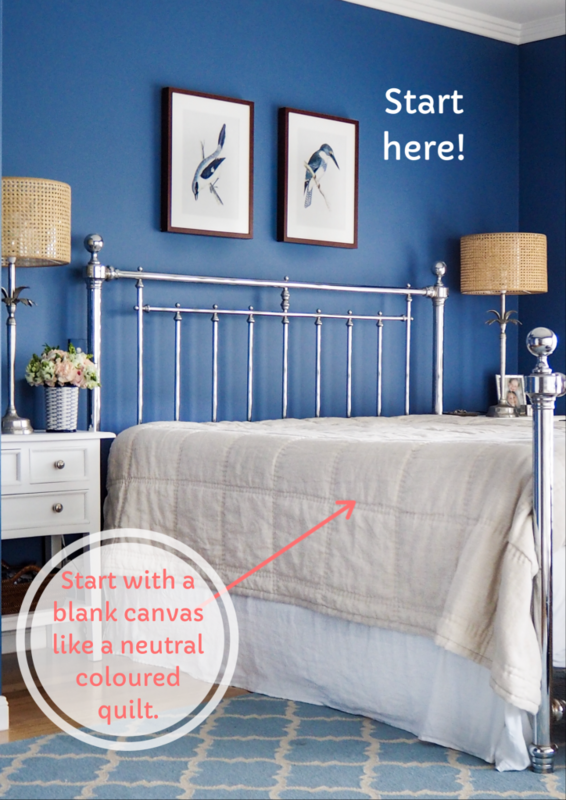 If you prefer or already have a plain doona cover in a neutral colour that will also be a perfect starting point. Currently I have a natural coloured linen quilt on my bed. If you’ve followed me for a while you’ll know how much I love linen, you can read all about it here. 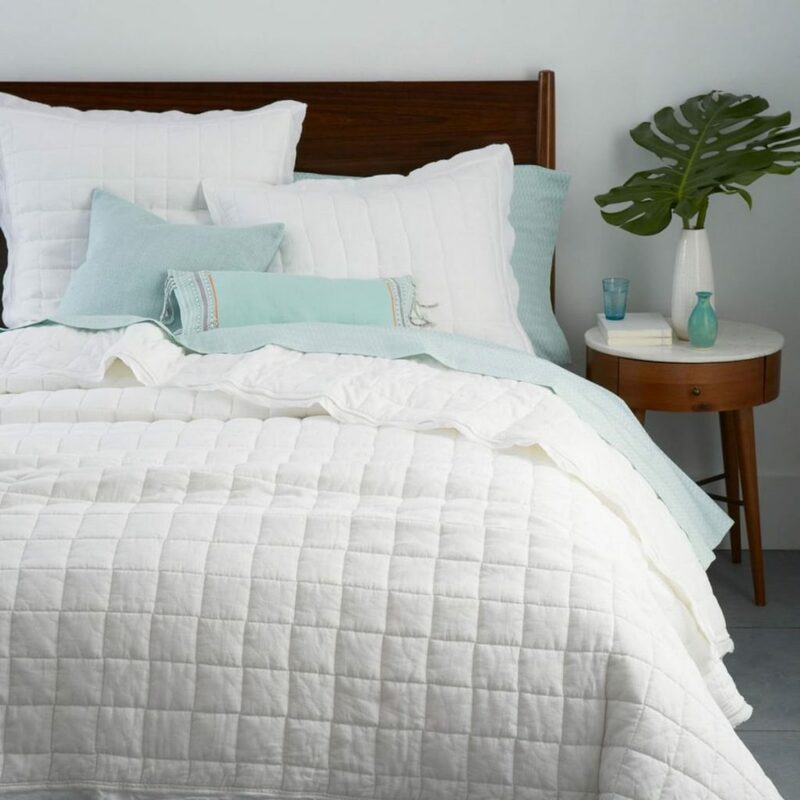 I’d really love a pure white or light grey/silver quilt going into the warmer months. I think white always looks so fresh and serene, and silver is cool and inviting. I’ve shared my favourites below. 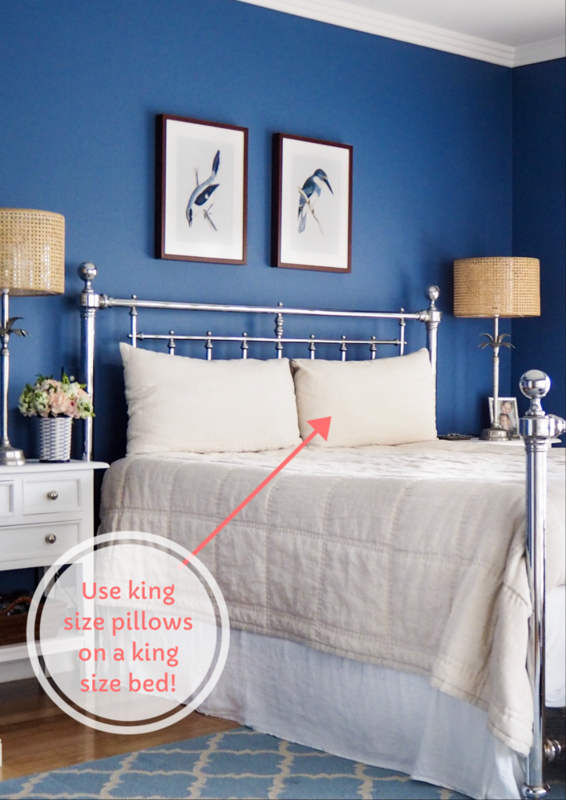 I like to use king size pillowcases on a king bed, it fills the entire space so you don’t have a gap between them. I have taken a few photos of my bed with king size pillows and with standard size incase you don’t have any in the king size. Mine are from The Pillow Slip Store, you can find them here. They also have the best range of king size pillowcases around. 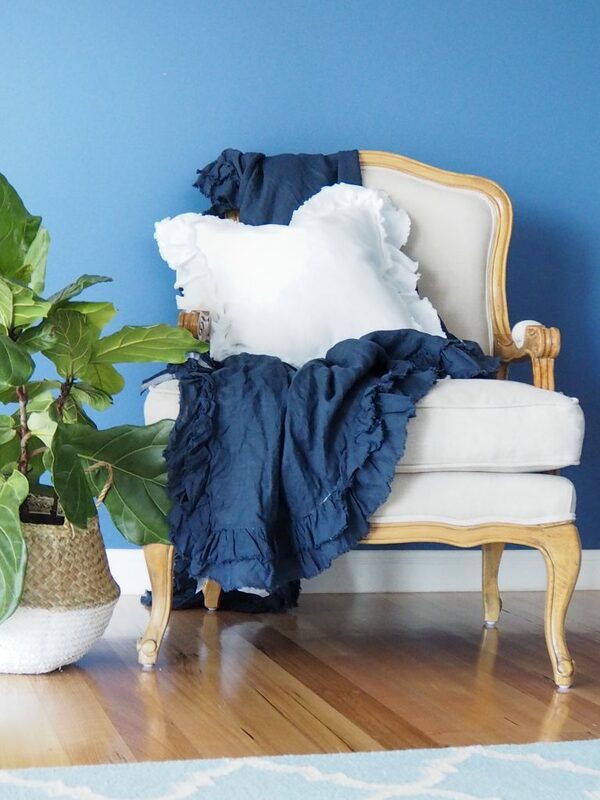 Ruffles Linen King Pillowslips – big love! This is where we start to add layers with a second set of pillows and a blanket, throw or second quilt. I like to add a contrasting colour or a pattern. If you are unsure about mixing patterns and you’d like to add a patterned cushion, stick with a plain colour, any colour that makes you happy and works with the other elements in your room, also look for some texture to add interest. My diamond quilted linen throw is available in heaps of colours. You could also use one of these as your base quilt, I switch mine around often. Next, add your favourite cushion to the middle of your pillows. 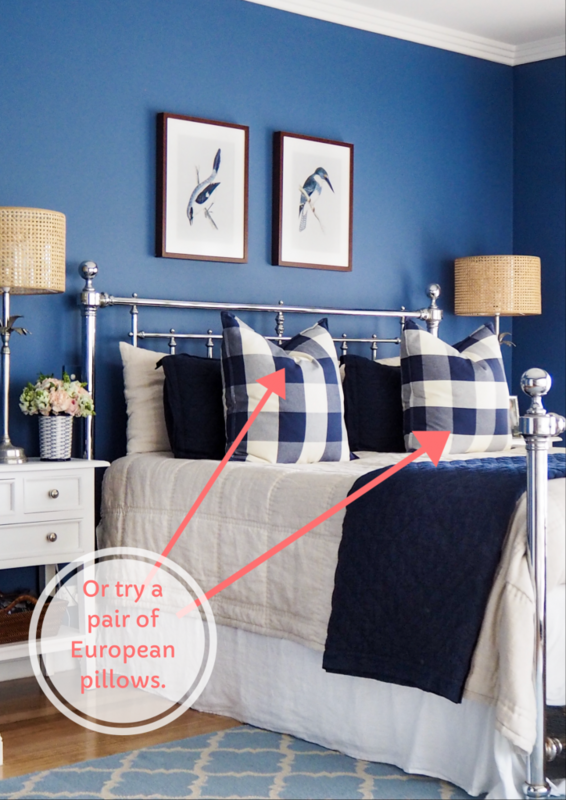 This is probably the most basic styled bed and super easy to accomplish everyday. The bonus with this one is you don’t have to remove and replace a huge pile of cushions every morning and night. 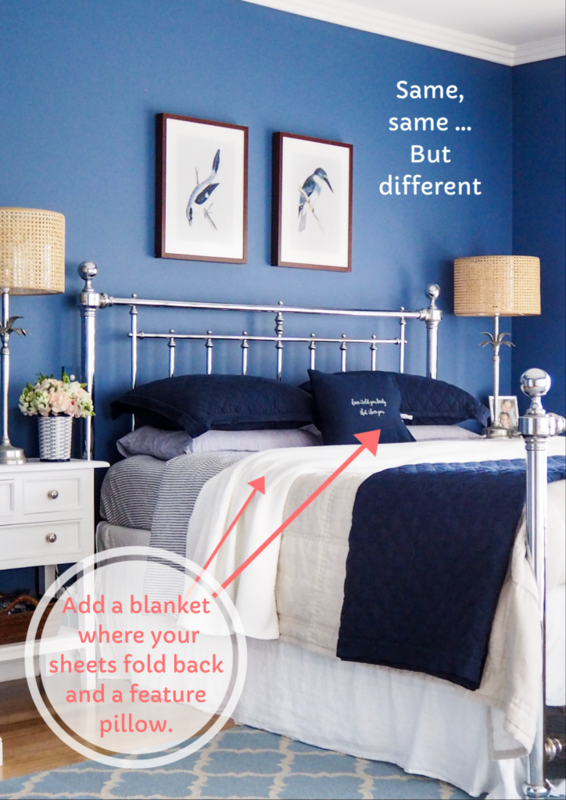 Another option which is just as simple, add a pair of cushions in front of your pillows. 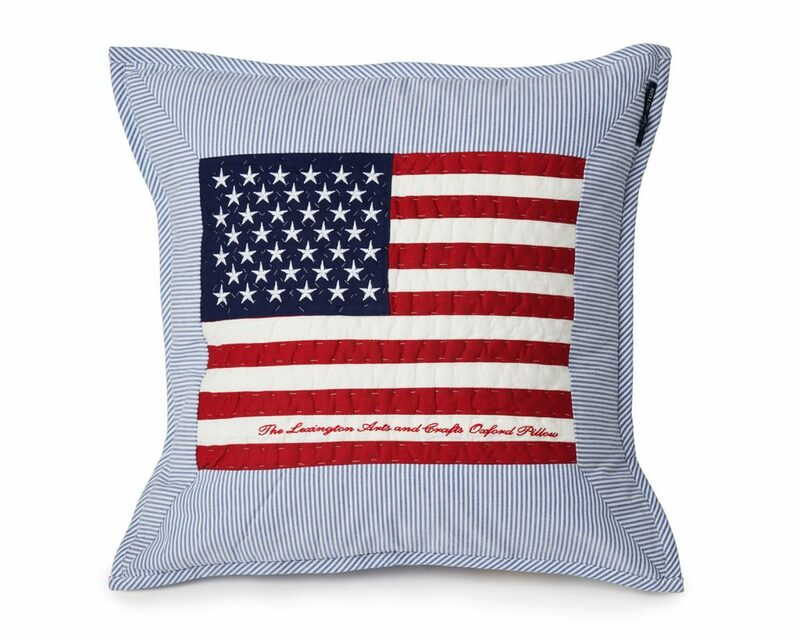 You can try european size or smaller throw cushions. 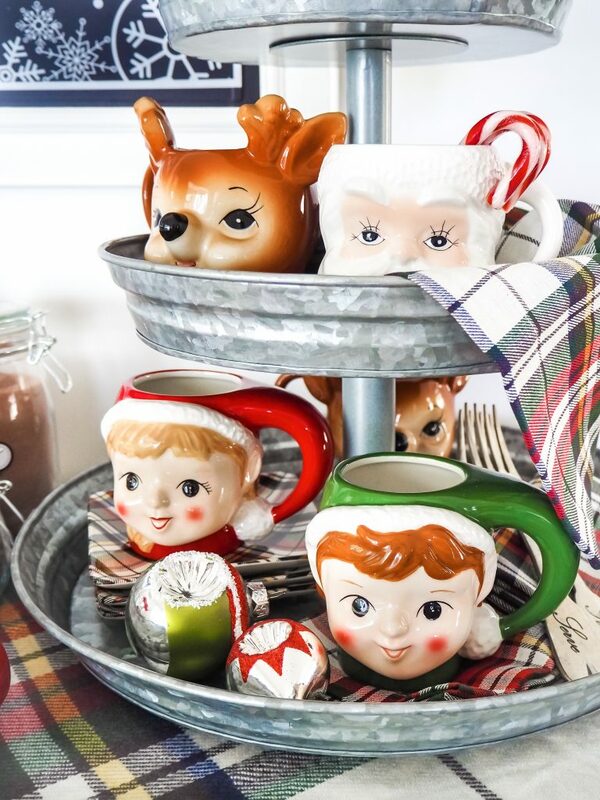 The ones I’ve used below are from Pottery Barn and are no longer available, but I’ve found some similar if you love them. TIP: Always use feather inserts, they plump the cushion out and make it easy to give it a good chop in the middle. I buy mine from Ikea where they are great value. Ok, lets try something slightly different. Here I’ve used standard size pillows and laid them flat instead of vertically. I’ve also folded my sheets back over the top of the quilt. 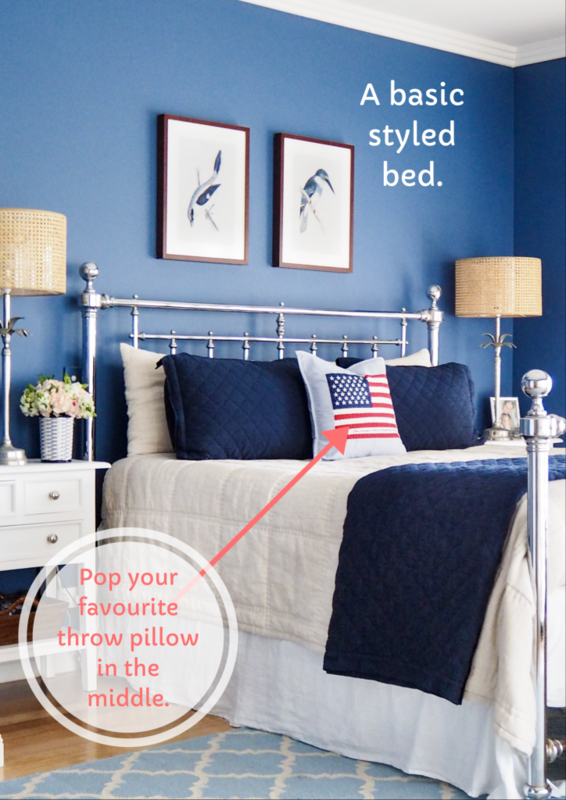 This looks great if you have patterned or coloured sheets in coordinating colours. My sheets are from Bed Tonic here. 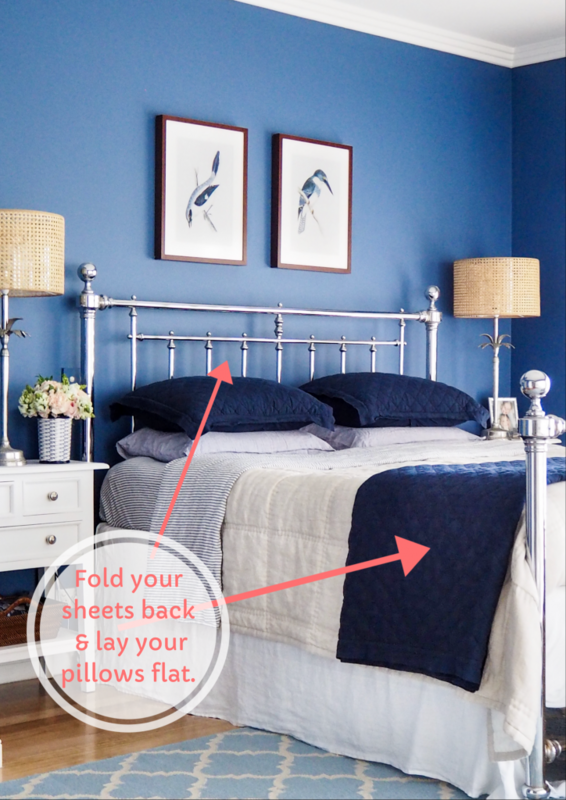 Again, add your decorative cushions and another blanket or throw where your sheets are folded back. My hand embroidered cushion is from Cathy Penton Atelier here. And the white blanket is from Canningvale here. 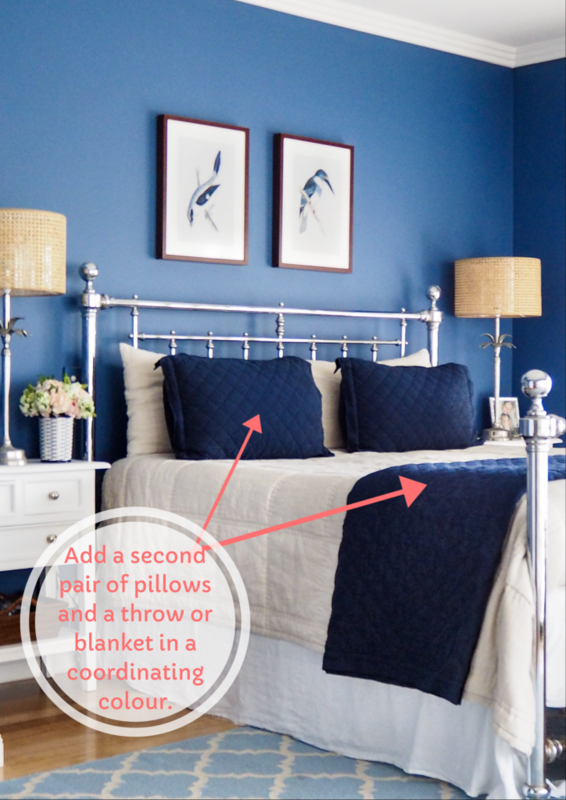 If you’re feeling rather creative, try laying 2 pillows vertically and 2 horizontally. Add 2 decorative cushions in different sizes, I like to use one square and one oblong cushion. Look for interesting fabrics, textures or patterns. I’ve mixed a leather cushion with a linen cushion, such a perfect pairing. Add a textural throw for more interest and luxury. The leather cushion is from Square Fox Design here. 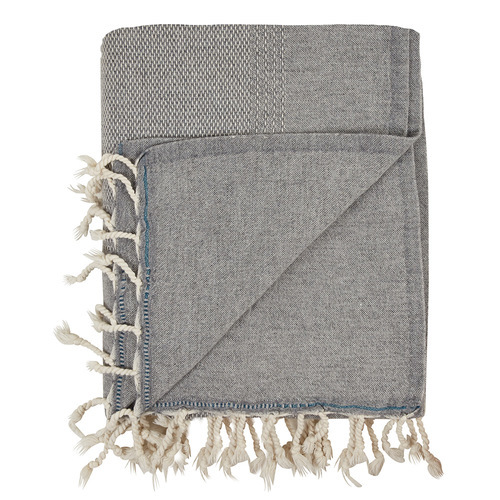 The throw is one of my favourites from Mayde, it is super soft and such beautiful quality. The blue is no longer available, but they still have a few left in charcoal. 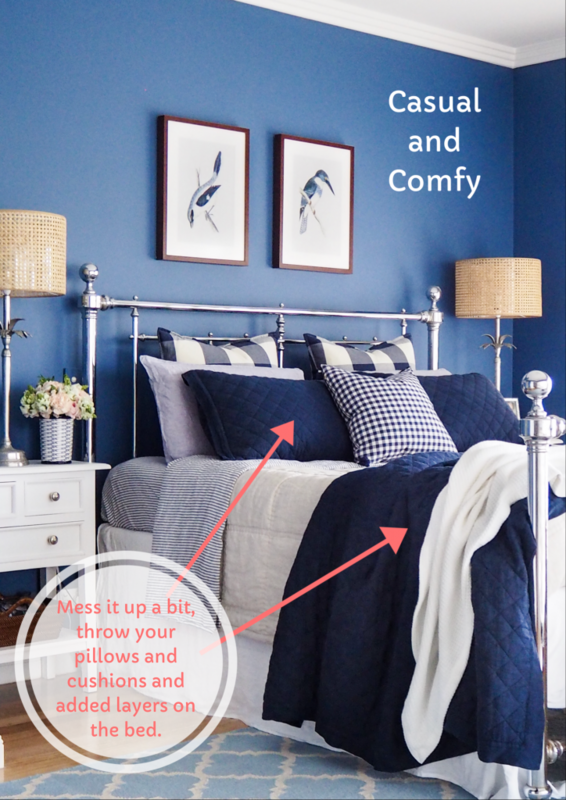 Lastly, if your in a rush in the mornings, try the relaxed look with layers of cushions casually thrown on the bed and a couple of blankets and throws unfolded and tossed on the end of the bed. 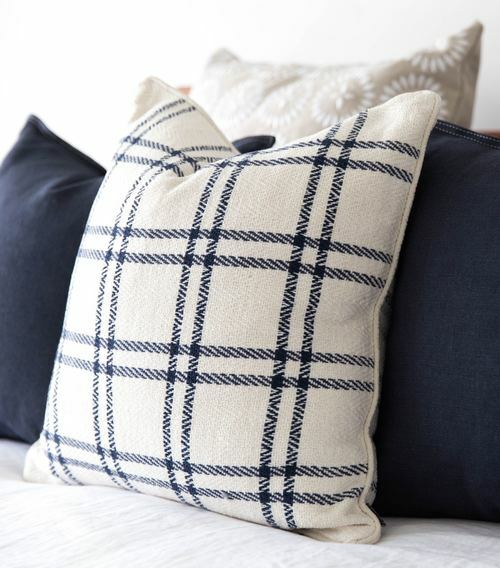 The gingham cushion is by Caitlin Wilson from That Pretty Market. There really aren’t any rules! 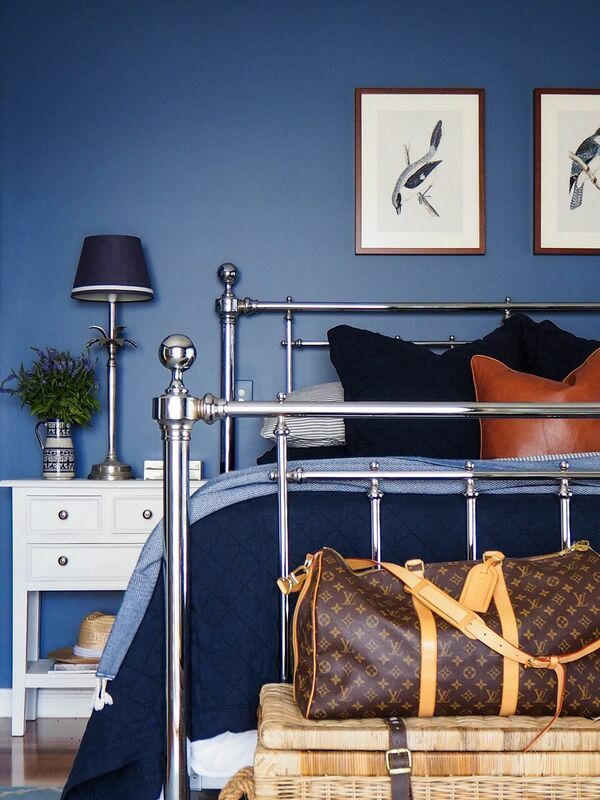 If you are on Instagram, search the hashtag #MLLbedstyling too see a few of my combinations. If you follow me over on INSTAGRAM you would have seen and heard me raving on and on about linen lately. No, I am not sponsored by the Linen industry, is that even a thing? I just truly, madly, deeply love it! I can see you rolling your eyes out there, like I’m all a bit crazy about this linen stuff. This is what I say to you – Don’t knock it till you’ve tried it. I challenge you to sleep in it for a few weeks and not love it! I swear I sleep better! I find it cooler in winter but still warm enough to keep me comfortable when hubby blasts the air-con so cold we are all shivering. I love the way it drapes over your body with a gentle weight and super soft texture. And the best part, I have embraced the crumpled look, it looks luxurious and inviting and I can’t wait to jump into my bed every night. Apparently, neither can the rest of my family who are frequently found hanging out in there too! 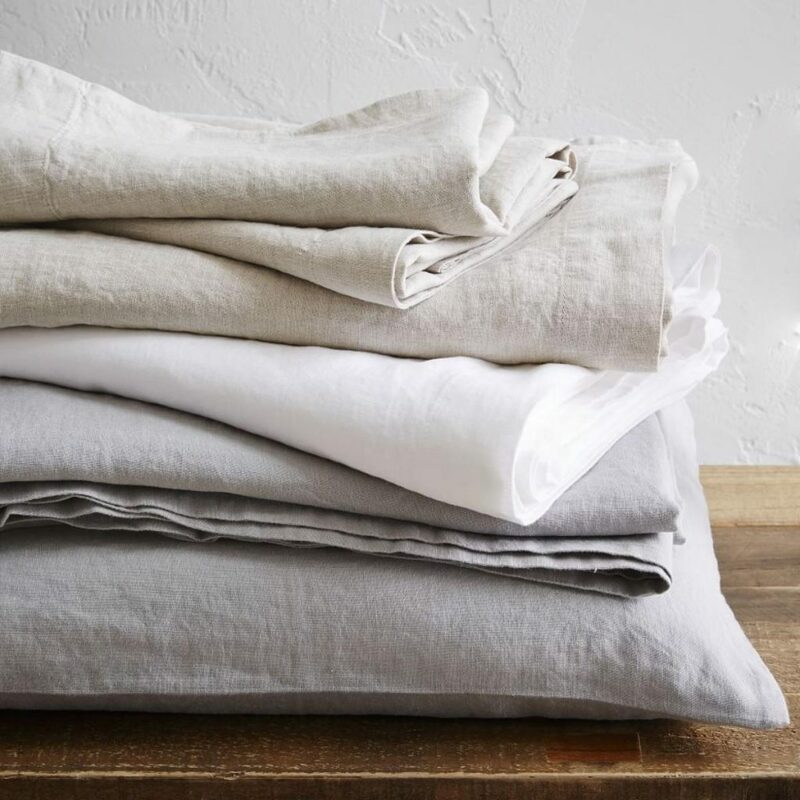 Why is linen considered by many to be the ultimate fabric for bedding? Linen is a 100% sustainable fabric grown from the flax plant. It requires very few pesticides and fertilisers during its growth cycle compared to cotton and uses a fraction of the water in comparison, making it much kinder to our planet. It’s incredibly buttery soft to sleep in and is a natural thermo regulator. Linen is cool in summer and warm in winter, why? Linen’s fibres are hollow grass like straws compared to cottons dense fibres. This allows air to flow naturally around your body in the heat and yet cosy warm under layers in the cooler months! I’ve read that linen is good for people with skin conditions or allergies, is this true? Because linen uses few pesticides, fertilisers and toxic chemicals to harvest, it is low allergenic making it kind to our skin. How long should our linen sheets last? Although our linen is still grown, harvested, spun and woven in much the same ways as earlier days, it is now put through an extra process called soft washing where the linen is washed with pumice stones after the garments and bedding have been made. This is similar to stonewashed jeans whereby it softens the fibres making it buttery soft from your first sleep. However this process does shorten the life of the fabric somewhat as you don’t have to wash it for years to soften it anymore like in the olden days. It also depends on how many sets of sheets you rotate on your bed. 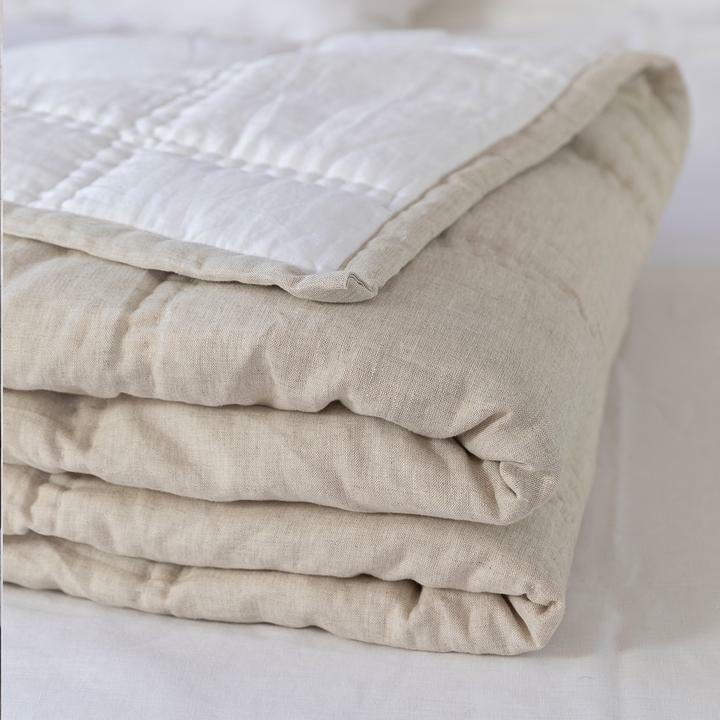 We have many customers who love their linen sheets so much they wash and dry them and put them straight back on the bed so obviously these would wear out quicker but you should still expect to get a solid 5 years plus from your linen. Do they require special care? Linen is not as fussy as it seems. It is pre washed before you sleep in it to avoid shrinkage. Warm machine wash and line drying is preferable but if you use a dryer keep the temp to warm or your linen will get very crinkled. Occasionally I get a customer who says their linen has got stiff. This is caused by a build up of soap powder and a water only wash will strip the build up and make your linen soft again. Fabric softener is also ok. If ironing is necessary (defeats the purpose of linen in our opinion), iron with a medium to hot steam iron. So there you have it, there is actual reasons why it’s so good! 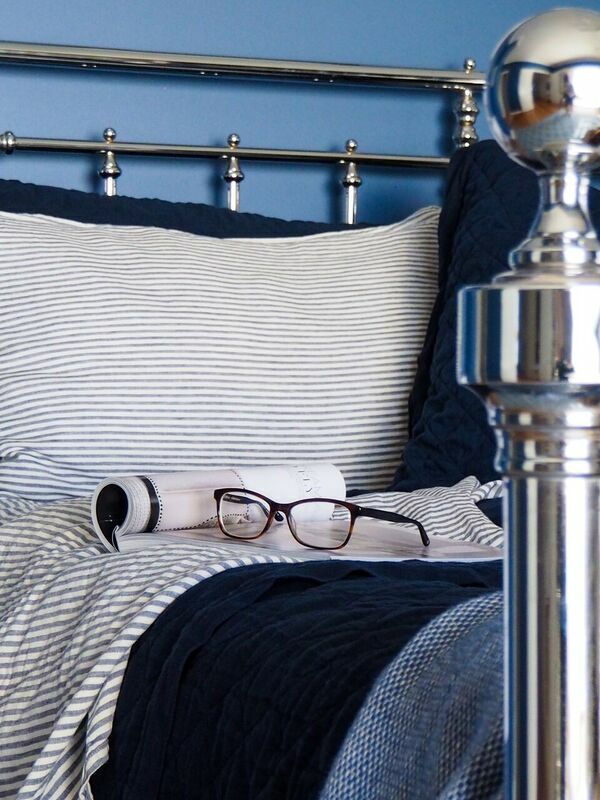 Navy Ticking Pure Linen sheet set from Bed Tonic here. Belgian Flax Linen sheet set from West Elm here. 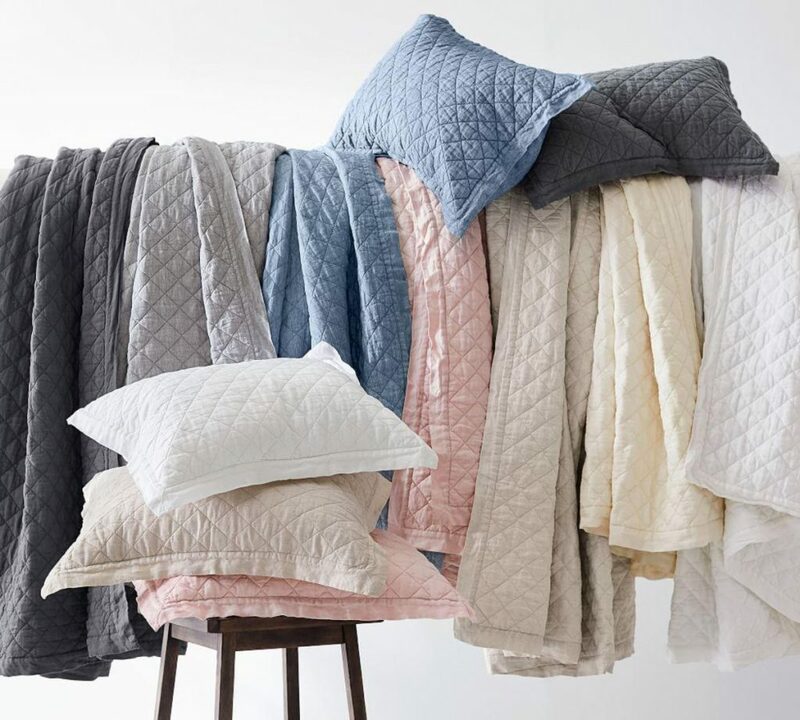 Belgian Flax Linen Diamond Quilt and Pillowcases from Pottery Barn here. 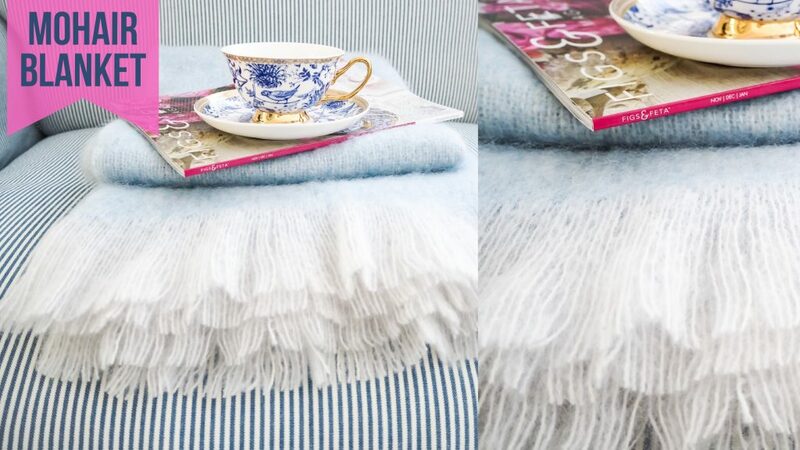 Isle Linen Ruffled Throw from Her Shed here. I also have the Capri Linen White & Natural Reversible Quilt from Her Shed which I am looking forward to using when the weather cools down, you can see it here. I’m sure I’ll add to my collection and I’ll be sure to let you know what I think in the future. Do you have linen? Are you as obsessed as me? I'm a Mum to 3 gorgeous kids and wife to a builder. We are serial house renovators and we have just completed our 8th home. 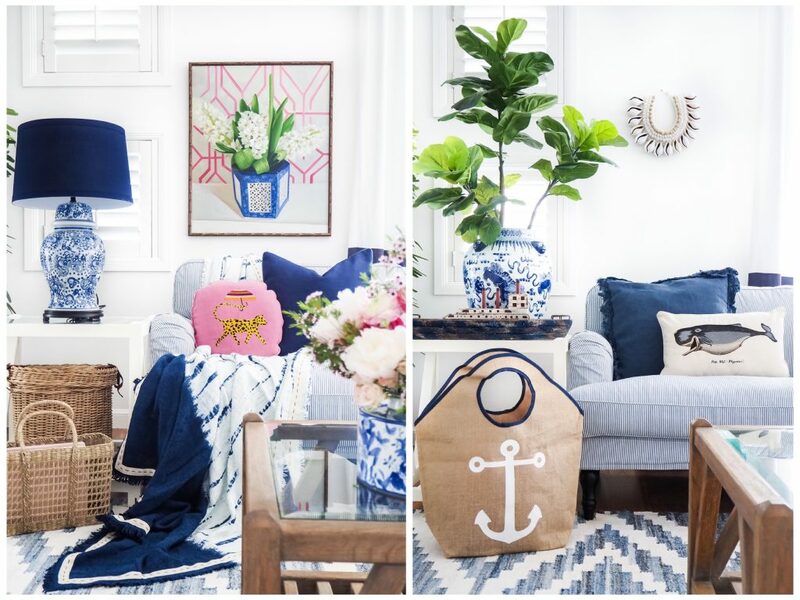 I love decorating with blue and white and pops of pink, I love country and coastal style and I've never met a spot or stripe that I didn't like. I believe in splurging & saving, practicality & pretty and keeping it real.